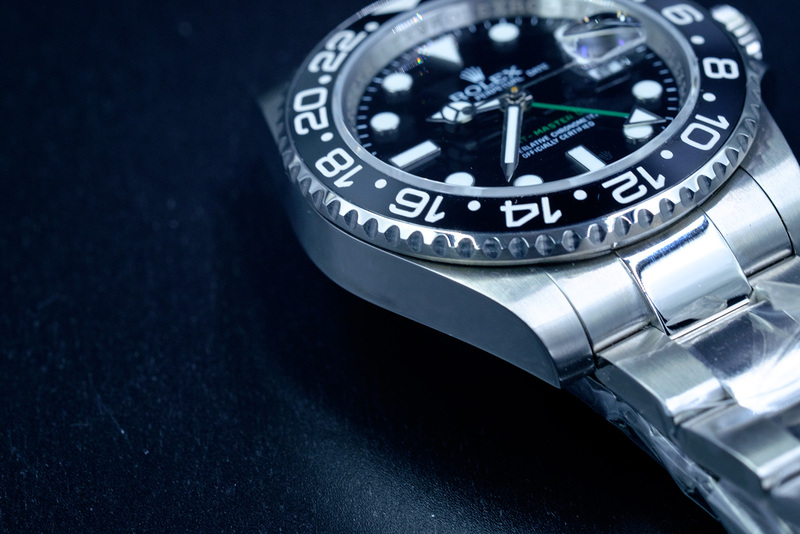 Big news for Rolex GMT-Master watch lovers! The competition between ARF and Noob is getting more and more intense. 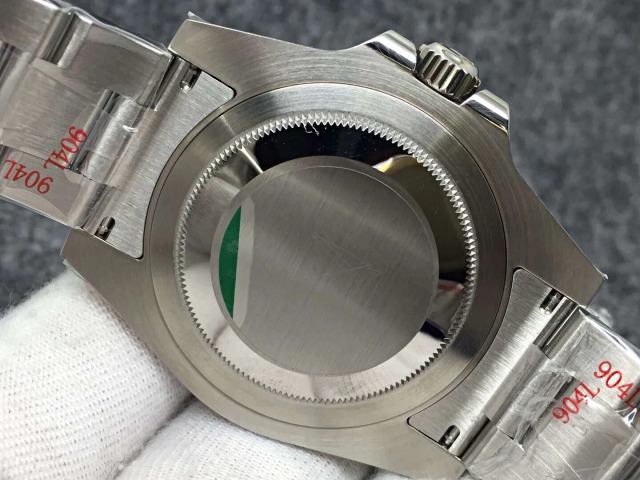 Since AR factory published their first Rolex made with 904L stainless steel and has applied this genuine material to every Rolex model they produced, now Noob is also keeping with its pace closely. 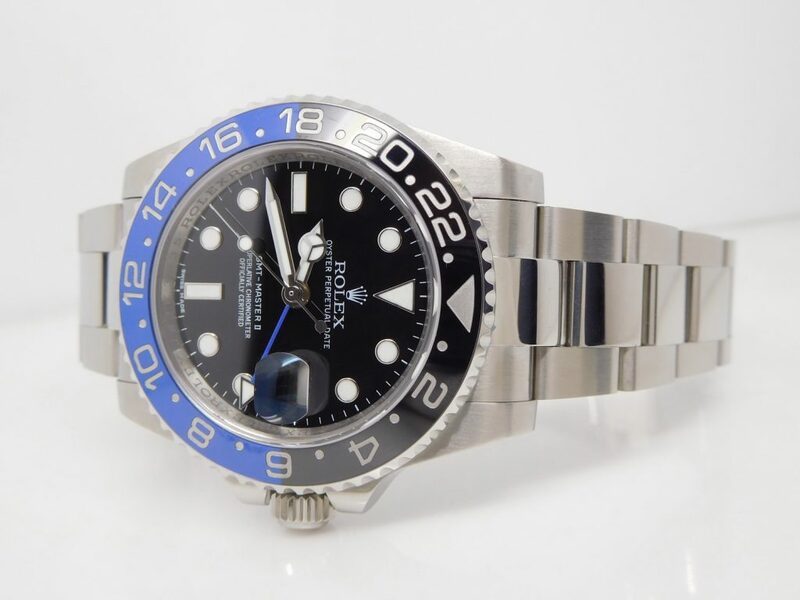 GMT-Master II116710BLNR Black/Blue and 116710LN are two popular models in replica watch market, they are top selling watches and loved by many people, so Noob has always improved these two GMT-Master watches and has upgraded them to V8 edition. 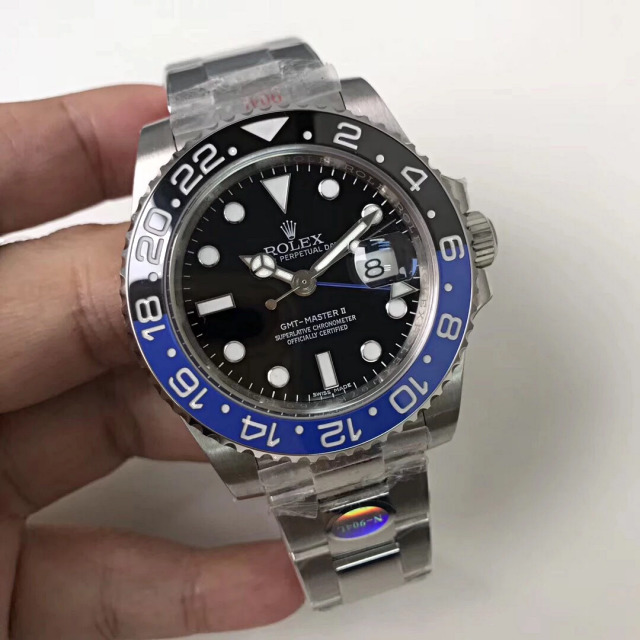 Last week, I learned from my watch supplier from Noob factory that they just released their new V9 edition of 116710BLNR and 116710LN, this is really a big news for us, because we have waited for a long time. 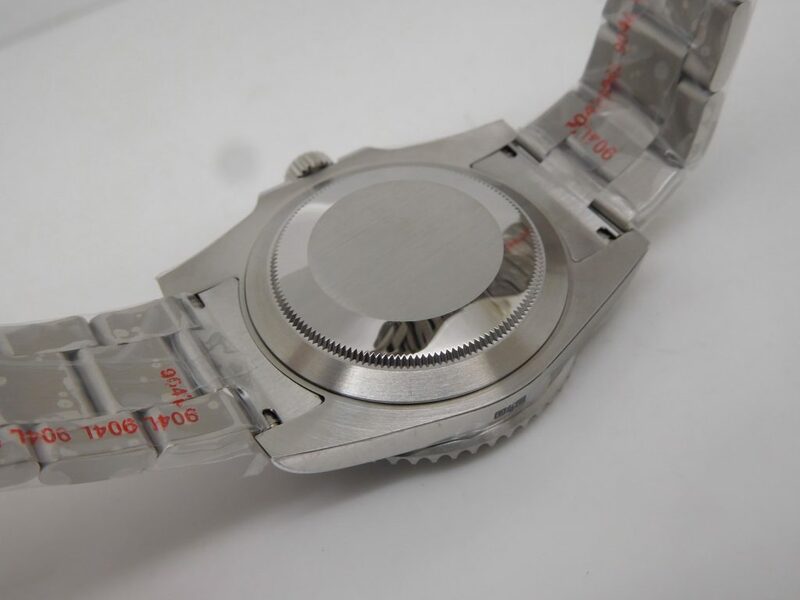 We know the previous V8 edition published in last year is made of common 316L stainless steel, along with so many GMT-Master replica watches made of 904L stainless steel by GM factory, we are very anxious, a lot of my blog readers have asked me when Noob will release their GMT-Master with 904L stainless steel, I replied that they could buy from GM factory, but they said no, they have been loyal Noob watch fans for many years. Ok, good things are worth waiting for. 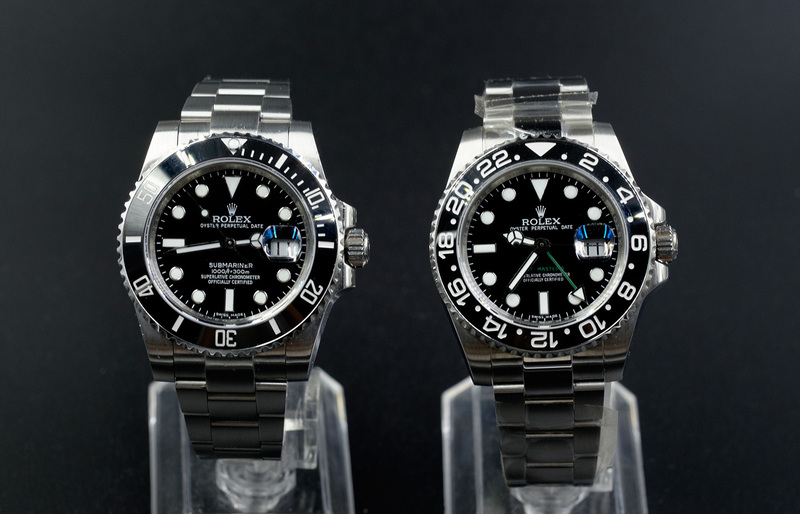 Now, Noob has the best quality GMT-Master II 116710BLNR and 116710LN, which are made of 904L stainless steel and equipped with clone 3186 movement. 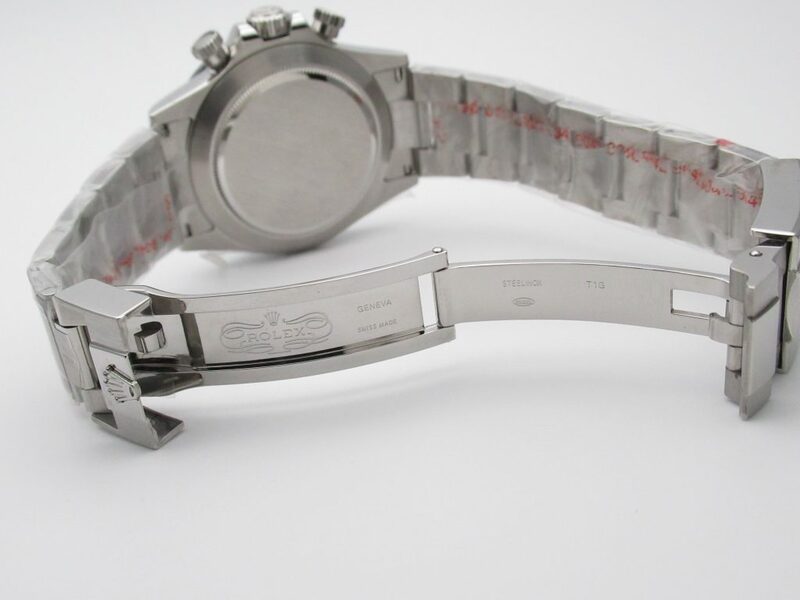 Except the stainless steel material upgraded from 316L to 904L, another big selling point lies in the hand stack, which is the same as that of genuine watch. 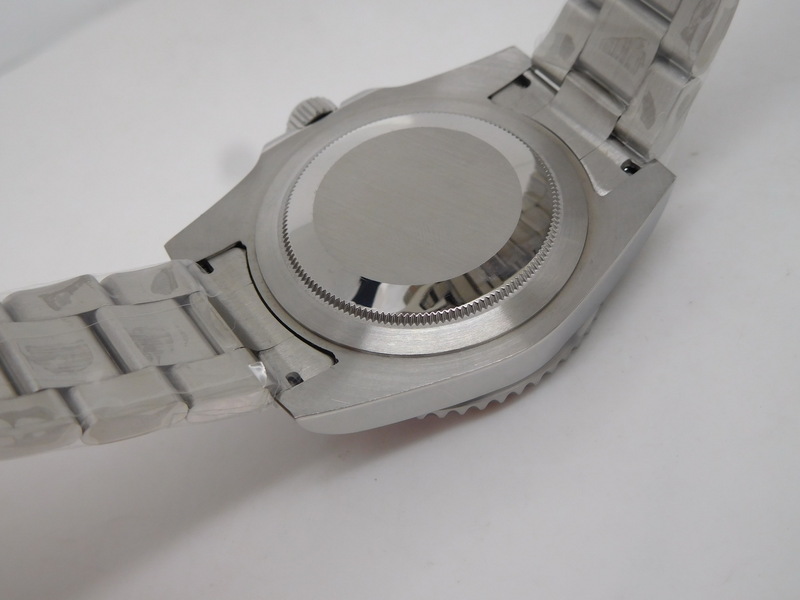 I borrowed two watches from my watch supplier and took some photos, both watches are really good, their stocks are also large. 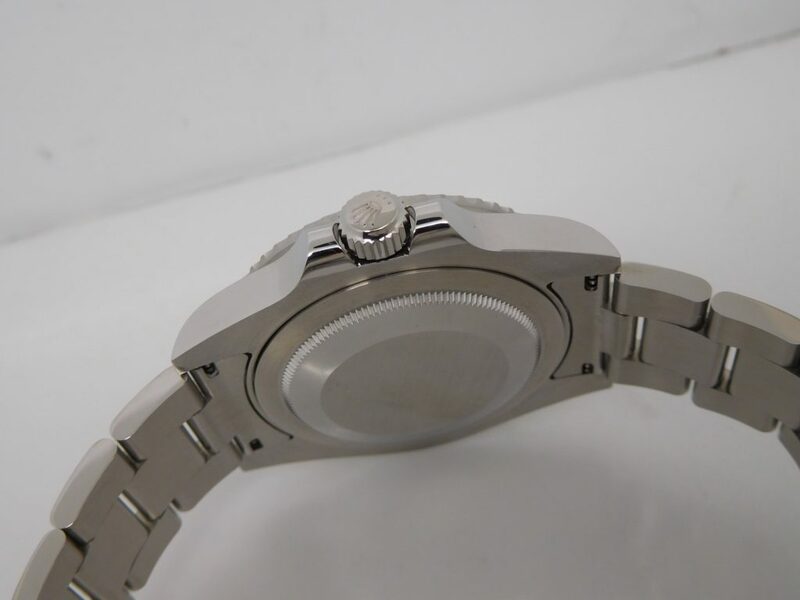 Besides material upgradation, V9 inherited all advantages of V8, such as Platinum coating on bezel markers, correct hand stack and correct rehaut. 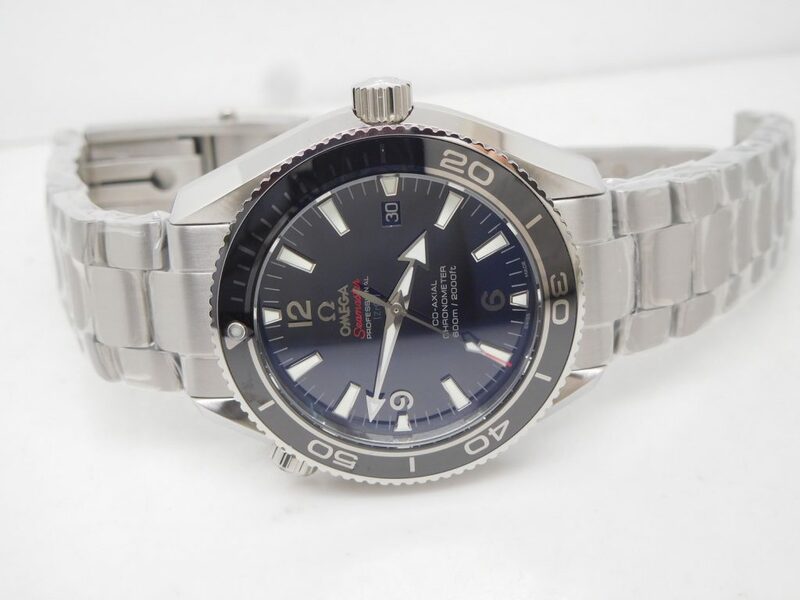 Because material upgradation, the price of the new V9 GMT-Master II116710BLNR and 116710LN is increased, it is also sold at a much higher price than the ones made by other factories. However, it is worth your money to buy better replicas,not wasting your money on those bad ones. 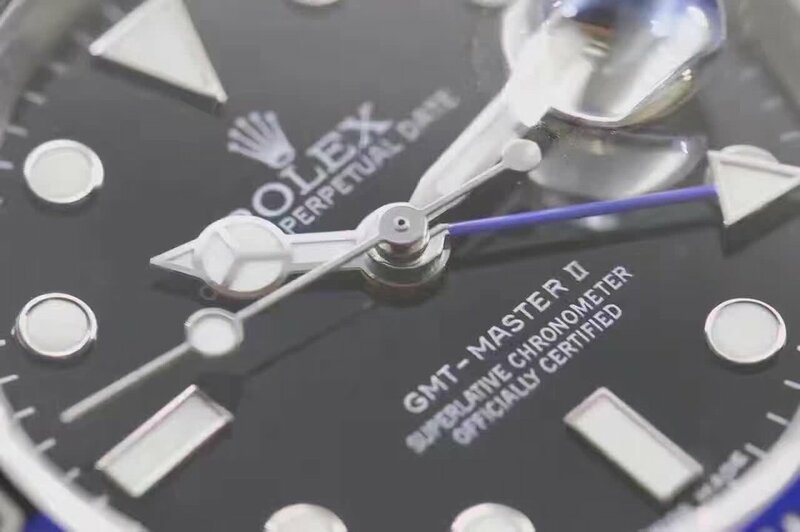 Whether in case or dial details, the replica Rolex watches from Noob, including GMT Master II 116710BLNR and 116710LN, are finished much better than replicas made by other watch manufacturers. 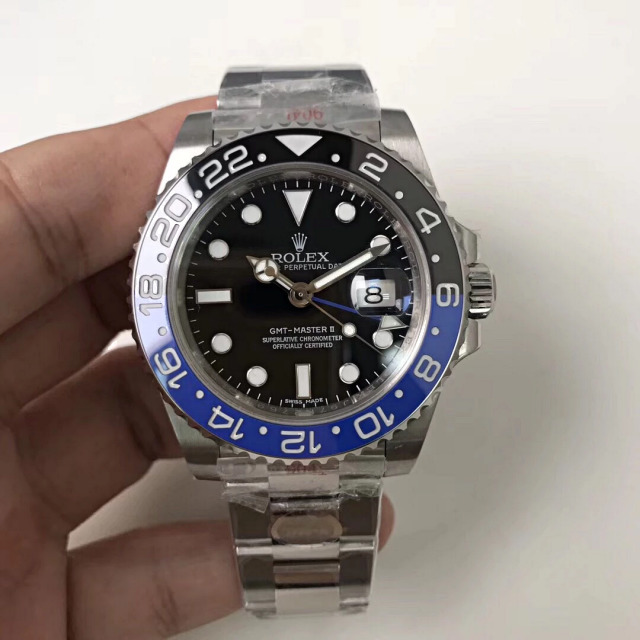 Currently, Noob has not publish the V9 models with ETA 2836 movement, so if you want to buy 116710BLNR or 116710LN with Asia ETA movement, you will still need to wait. The following are specification and detailed photos. Now it is nearly the end of 2018, I think it is time to make a summary of this year. 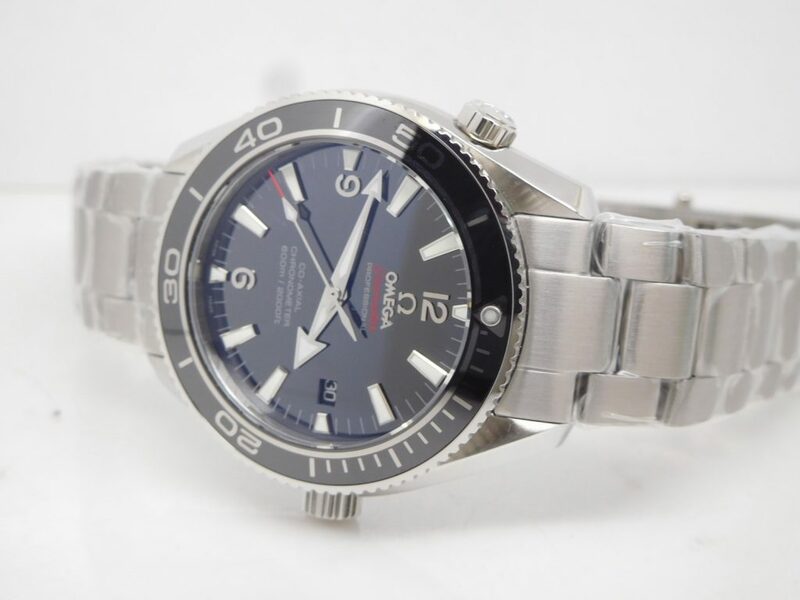 I know what you are really care about when buying a replica watch, you guys all want your replica to look closest to the genuine, so, today, I will publish an article about the top ten best-selling replica watches in 2018, they are also the best replica watches made in our market. 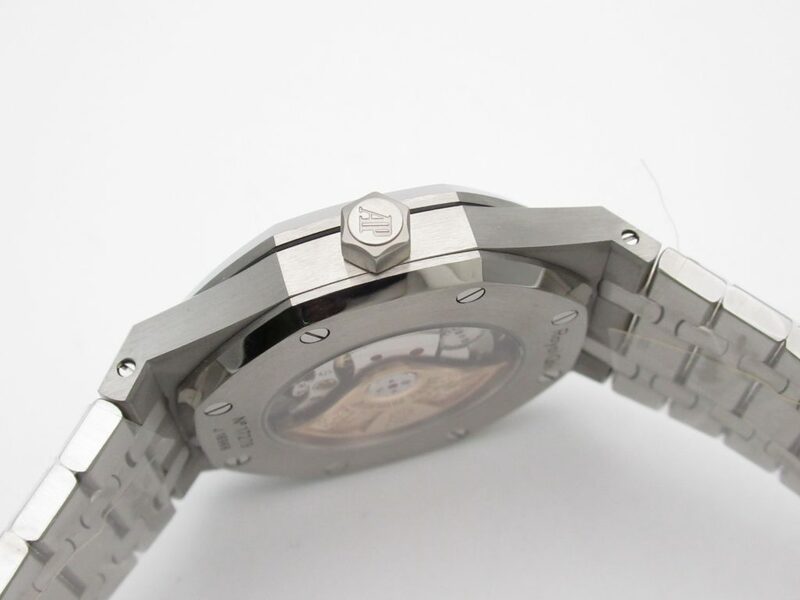 This article will also be an ultimate guide for you to find the replica watch that looks closest to genuine. Let’s begin. 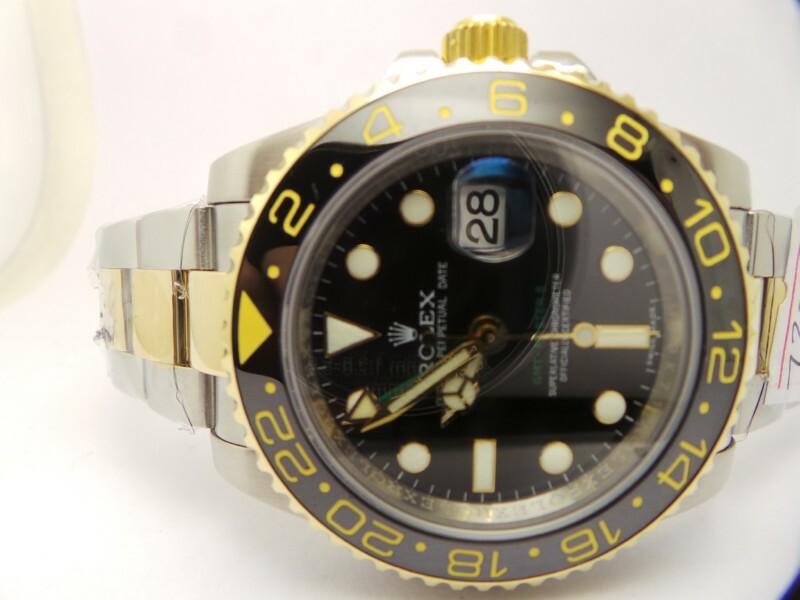 Rolex is the best-selling watch around the world, it is also the truth in replica watch field. 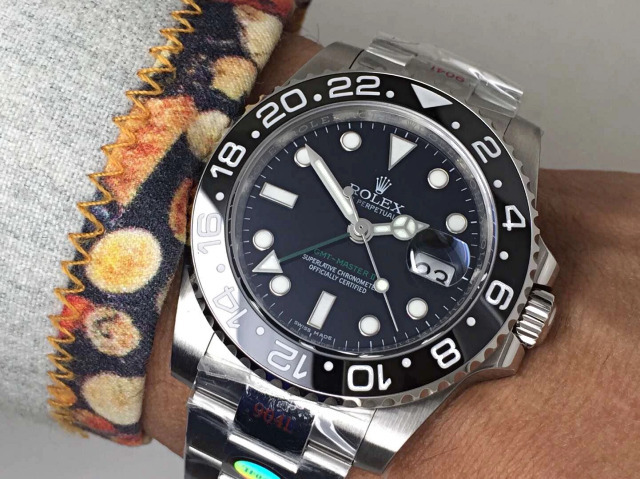 Noob factory published V9 edition in 2018, which means this is the ninth time Noob has made improvement on this Submariner watch. 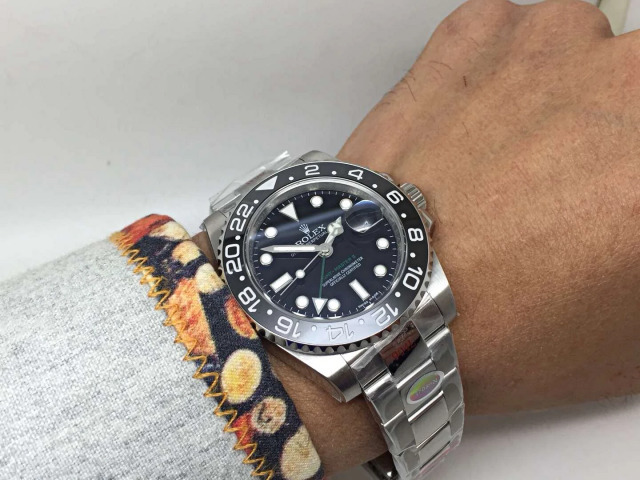 Now V9 Submariner 1166710LN is made of genuine 904L stainless steel in case and bracelet, the bezel engravings are closer to genuine in color and thickness, V9 Submariner 116610LN has two movement options, Asia ETA 2836 and Super Clone 3135. 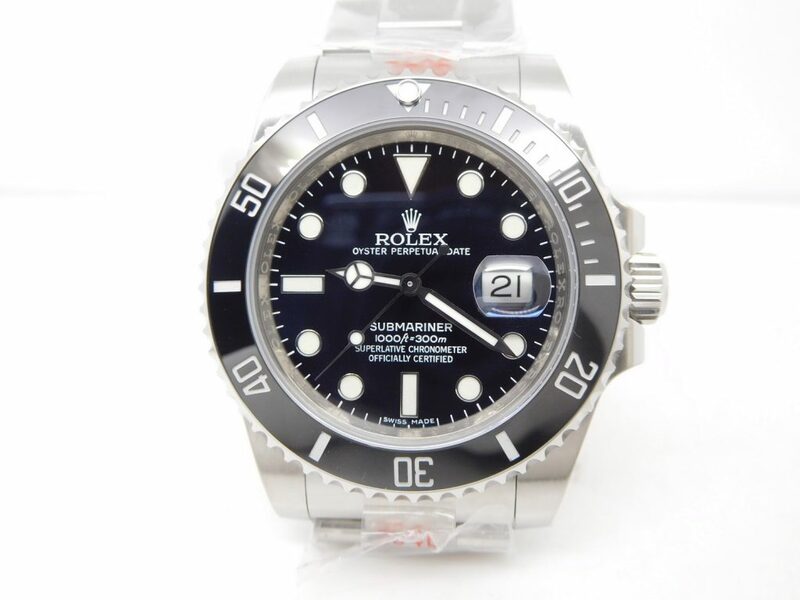 V9 Rolex Submariner 116610LN from Noob ranks first in this top ten list. 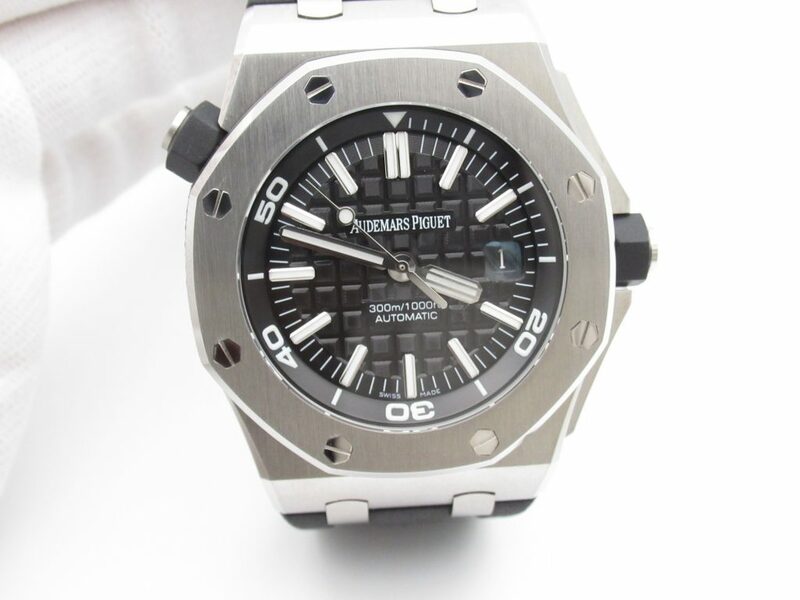 Audemars Piguet is a famous sports watch brand from Switzerland. 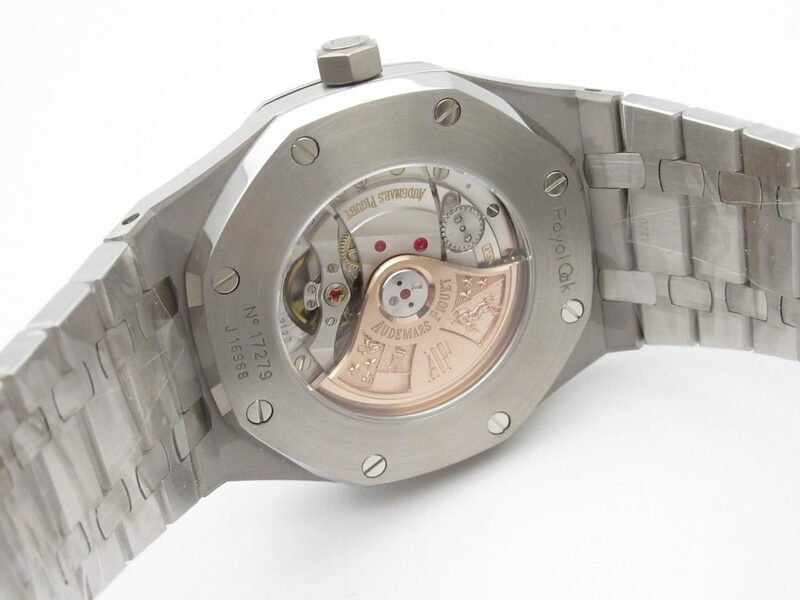 Royal Oak is their iconic series and is well-known among watch fans due to its octagon-shaped bezel. 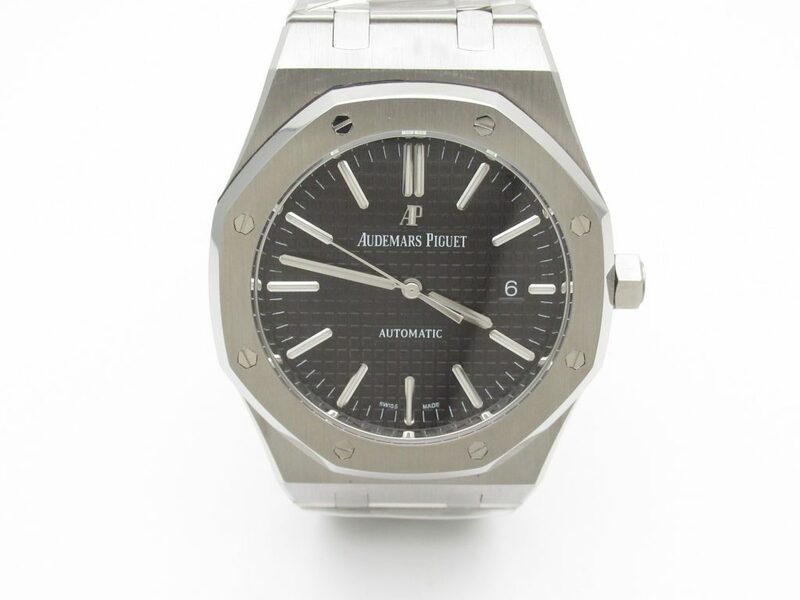 Audemars Piguet Royal Oak 15400 is the second best seller, it is the V4 edition from JF. 15400 not only has a top quality case finish, but it is also equipped with a super clone 3120 movement that looks closest to genuine AP Cal. 3120. The JF V4 Royal Oak 15400 has three dial color options, black, white and blue. 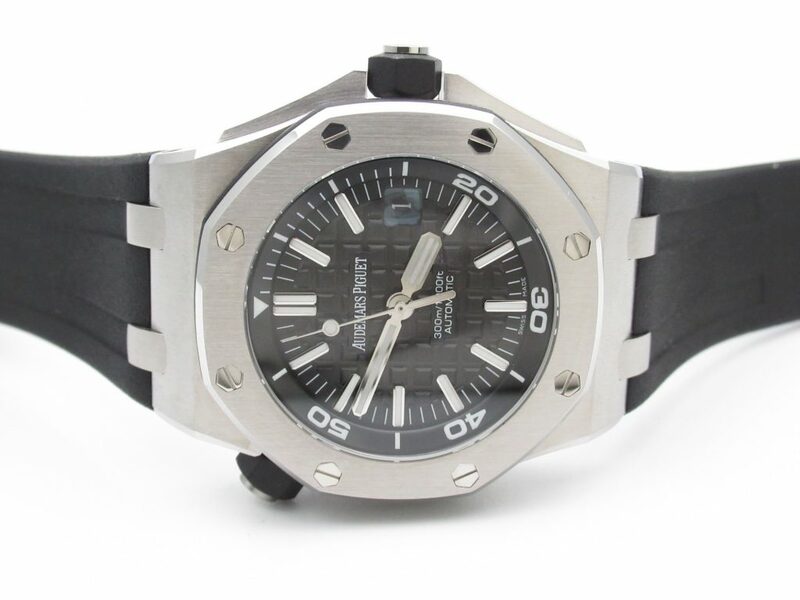 Royal Oak Offshore Diver 15703 ranks third. It is also made by JF, the newest V9.5 edition published in 2018. 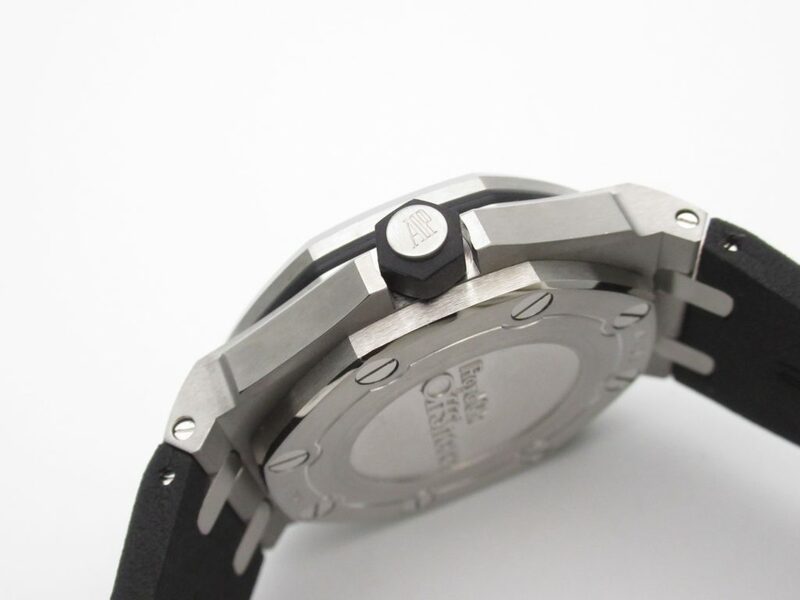 The watch is equipped with an Asia ETA 2824 automatic movement and one pair of rubber straps. JF makes the best AP replicas, you do not need to worry about the quality, it is superior and much higher than AP made by other factories. 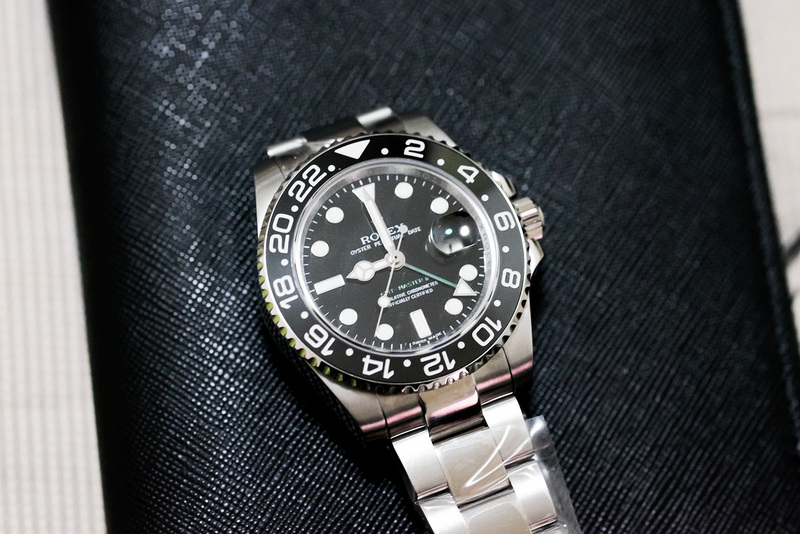 GMT-Master II 116710BLNR is always a hot watch. Now the replica has come to be V8 edition, made by Noob factory. 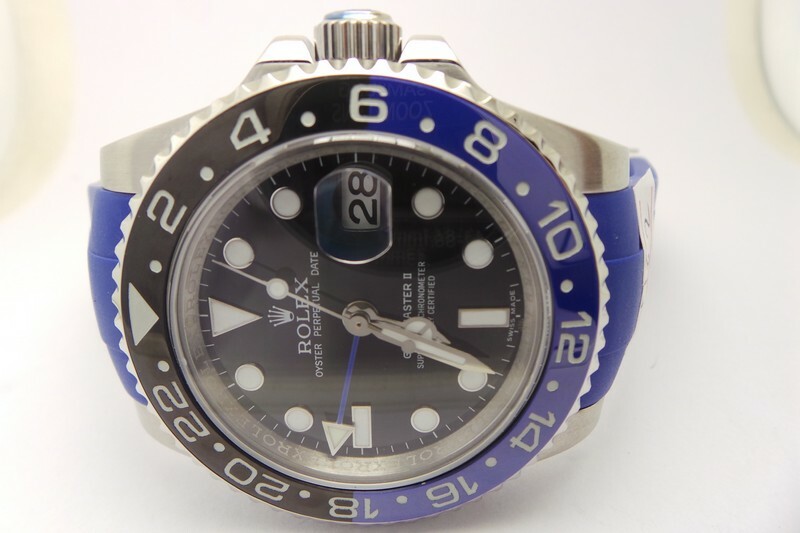 Black and blue ceramic bezel makes it stand out among other Rolex GMT-Master II models. Now V8 uses an Asia ETA 2836 movement, which is very accurate and stable. GMT function also works the same way as genuine. 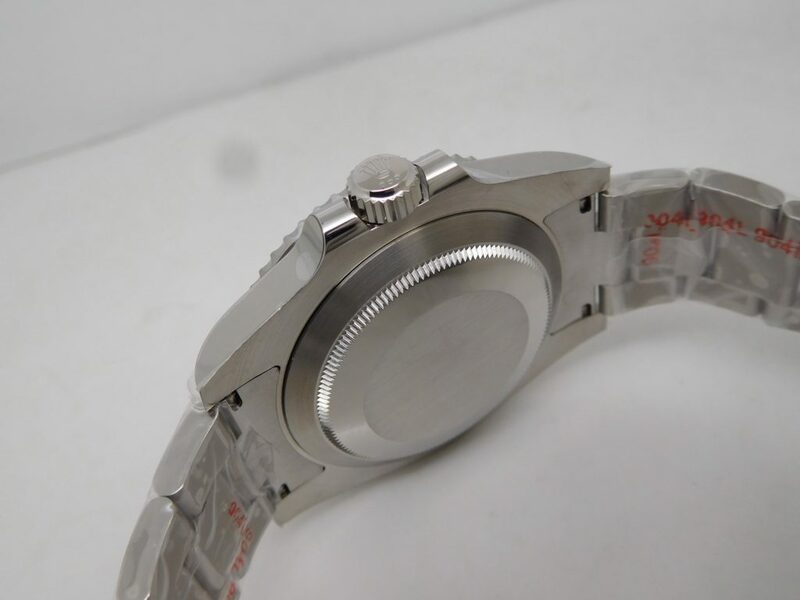 In 2019, I think Noob will make an important improvement on it, they will use 904L stainless steel material on this watch at least. Let’s expect. 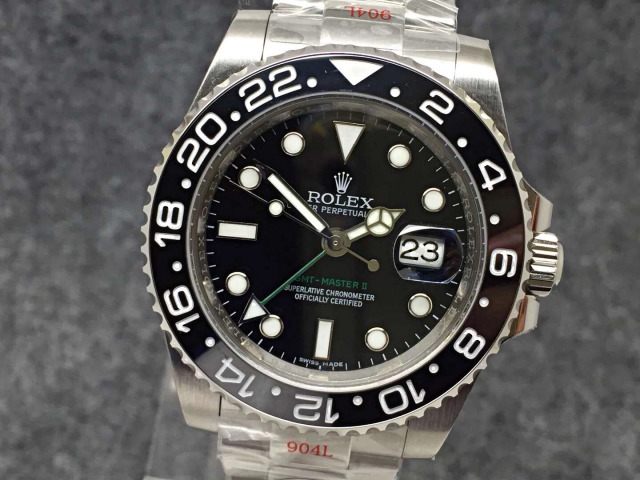 Sea-Dewller Single Red 126600 was published by Rolex in 2017 Basel, so it is a new face in our market. It was called “Single Red” because the SEW-DWELLER printing is in red on the black dial. 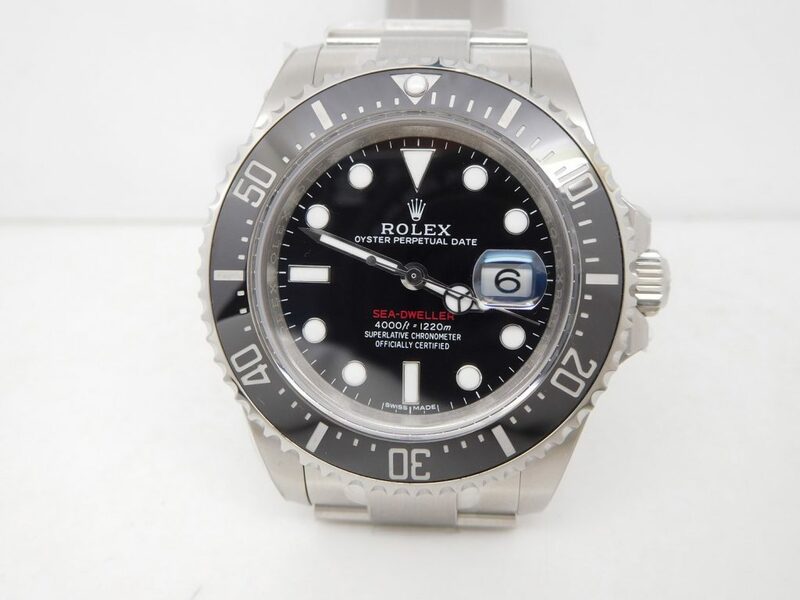 There are several factories manufacturing the replicas of this Rolex Sea-Dweller 126600, BP, AR, GM and Noob. Among them, AR makes the best replica Single Red 126600, Noob also makes it, but it does not use 904L stainless steel like AR factory. 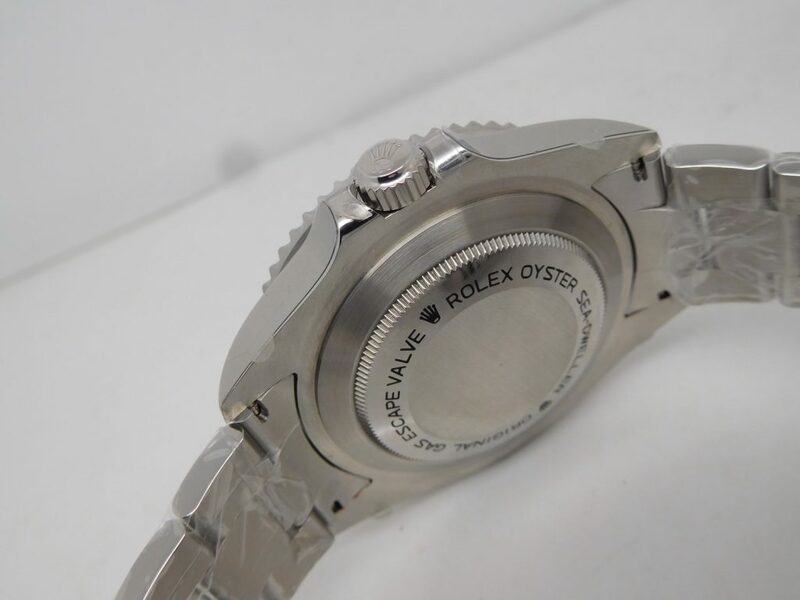 BP version has the price advantage but it only makes mid-quality Rolex replicas. 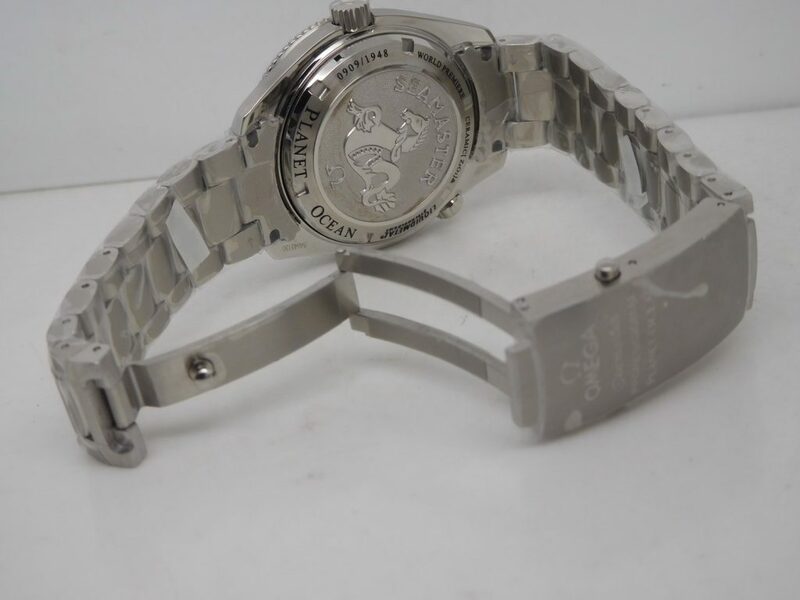 While GM is a new watch manufacturer, it does not have too much replicating experience. 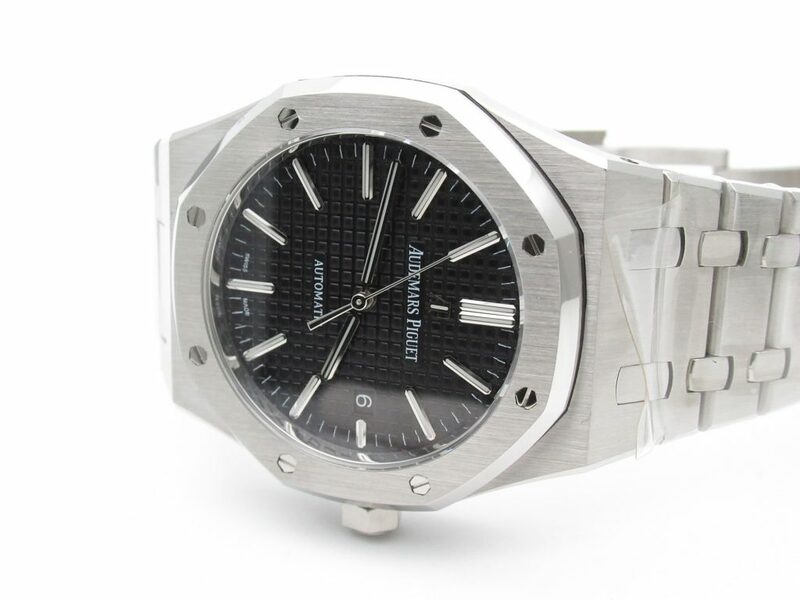 So, if you want a 126600 replica, just choose from ARF. Besides, this is the V2 edition they published, every detail has been upgraded. Noob made this replica several years ago, it was very hot once being published. 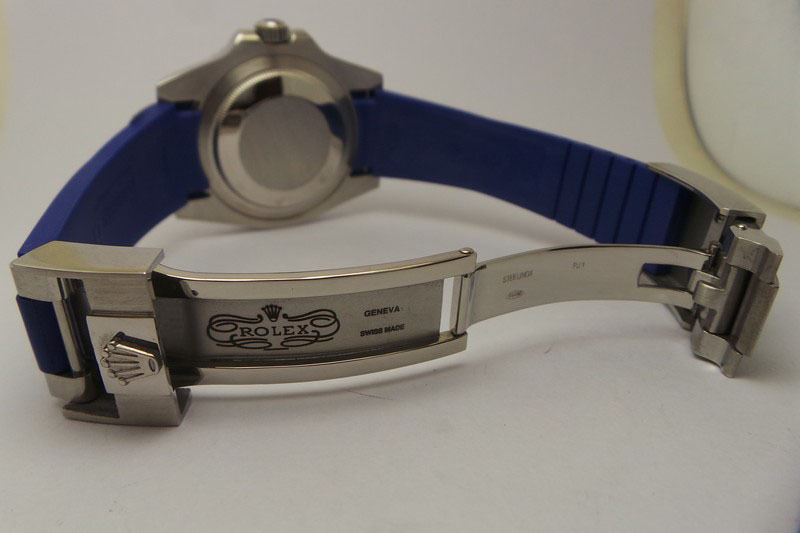 But the watch often does not have stocks, you need to wait for a long time after placing your order. Now the newest edtion comes to V6. It has several things improved. 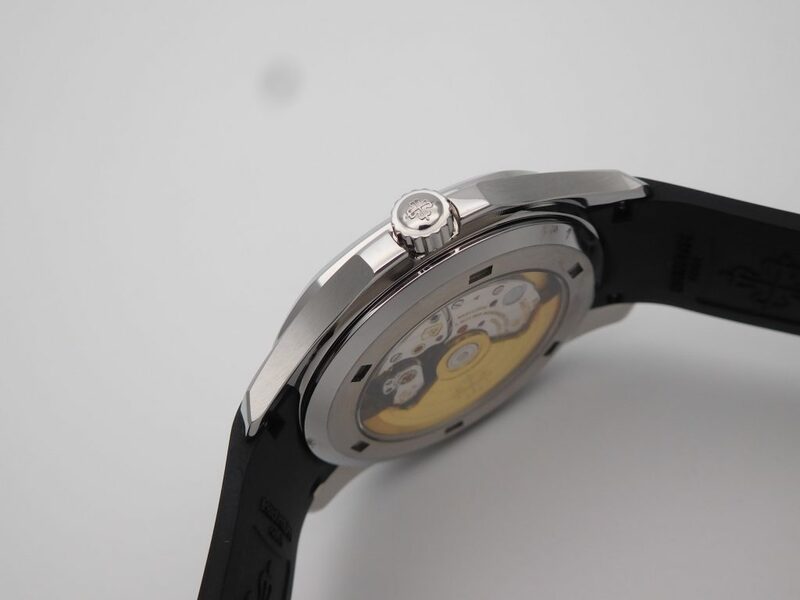 The dial now uses ceramic material, liquidmetal bezel like original, date font is corrected to be the same as genuine. The case back has high quality engravings now. 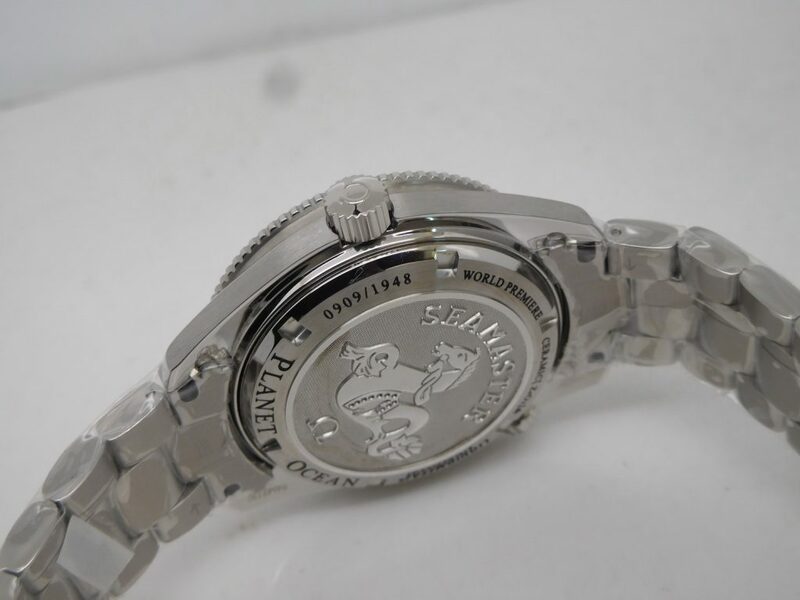 The replica Planet Ocean now is equipped with an Asia ETA 2892, like the mostly used ETA 2824, this movement also has a high stability. What watch will come in the seventh? 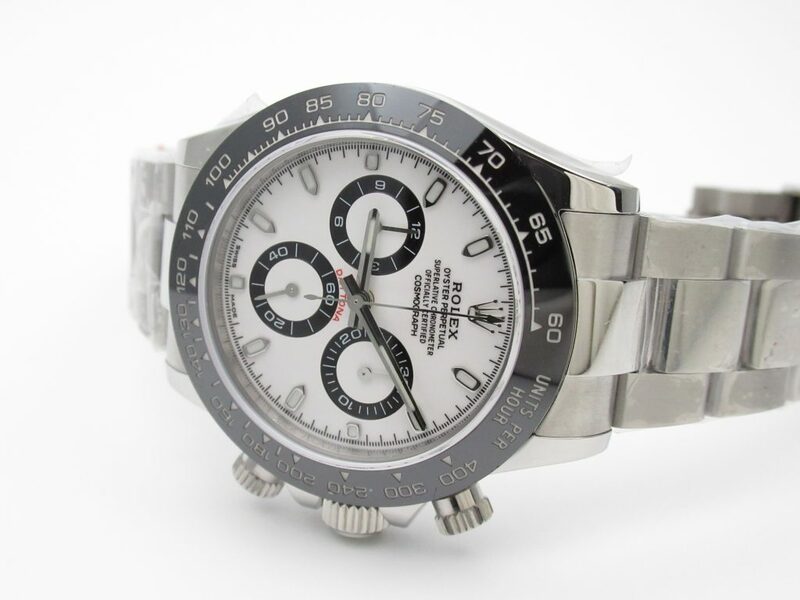 Yes, it is another Rolex watch, the Daytona 116500. 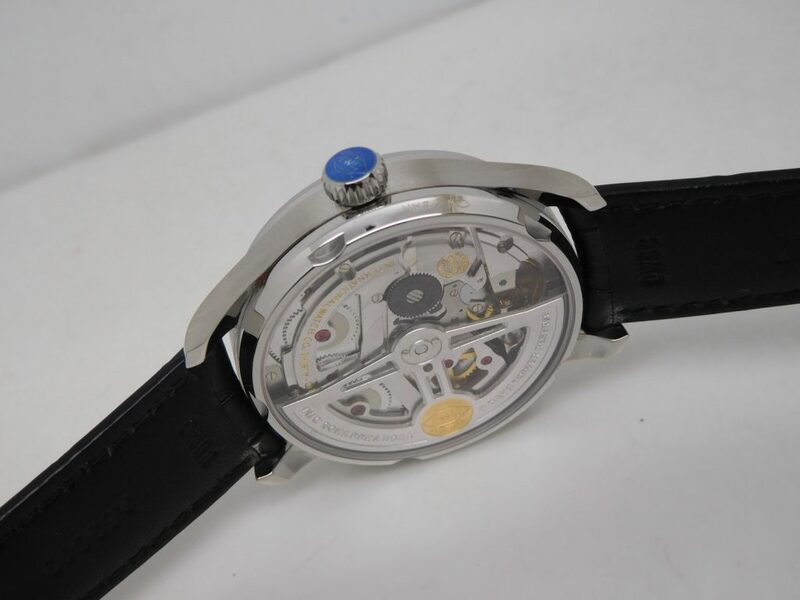 A lot of factories has made this watch, but Noob makes the best one. 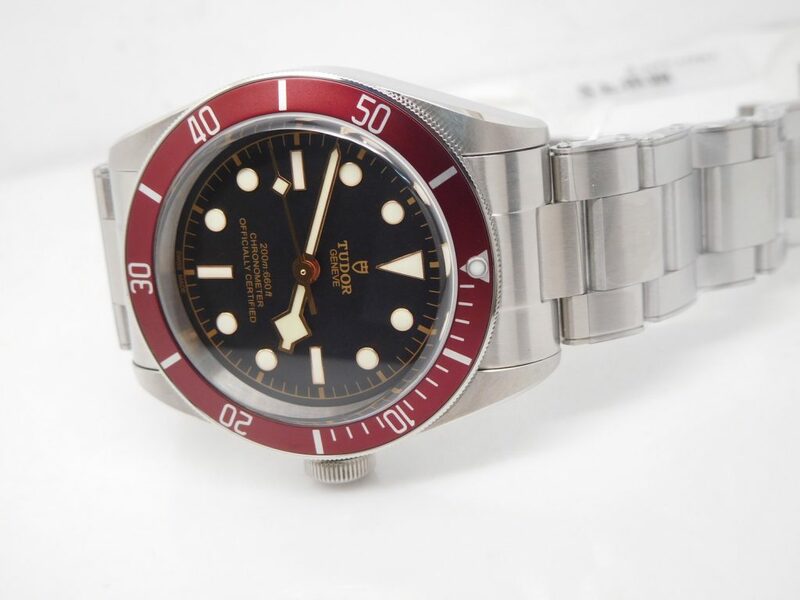 Among so many replicas, I will choose this one from Noob, not only because this factory has the richest experience in imitating Rolex, but they use the newest 904L stainless steel on this replica 116500. Three subdials all work, the chronograph is fully functional. 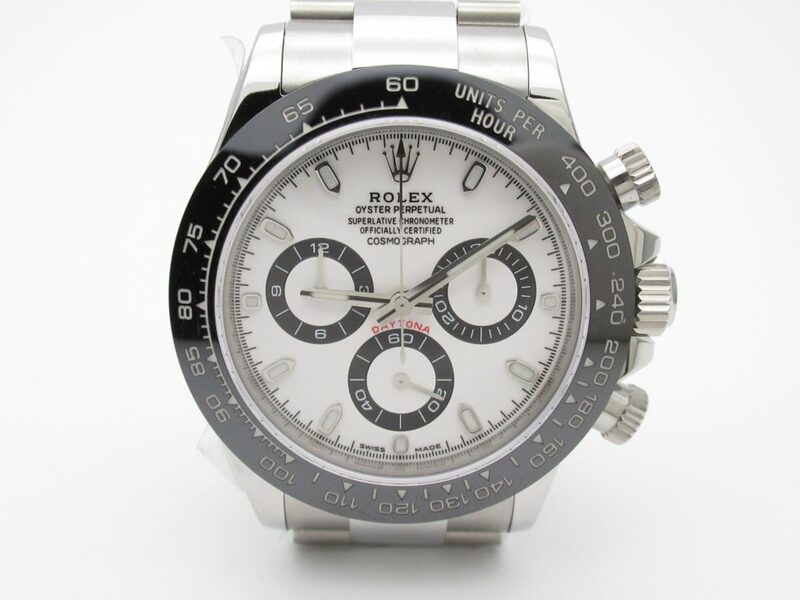 I do not recommend you buy this Daytona watch from ARF, because their hour-chronograph hand and minute-chronograph hand are fixed, means the chronograph is not real. 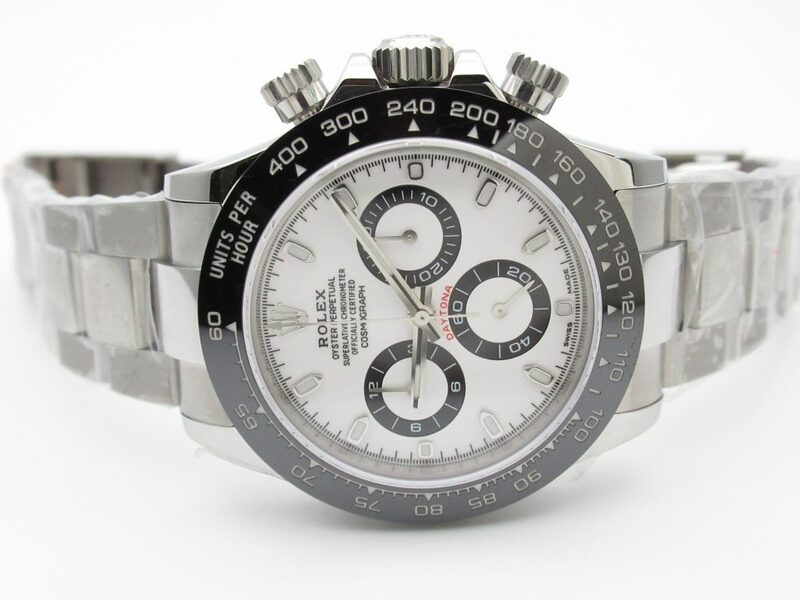 In the beginning of 2019, an important step ARF will make is on the chronograph function of their Super Clone Daytona Collection. 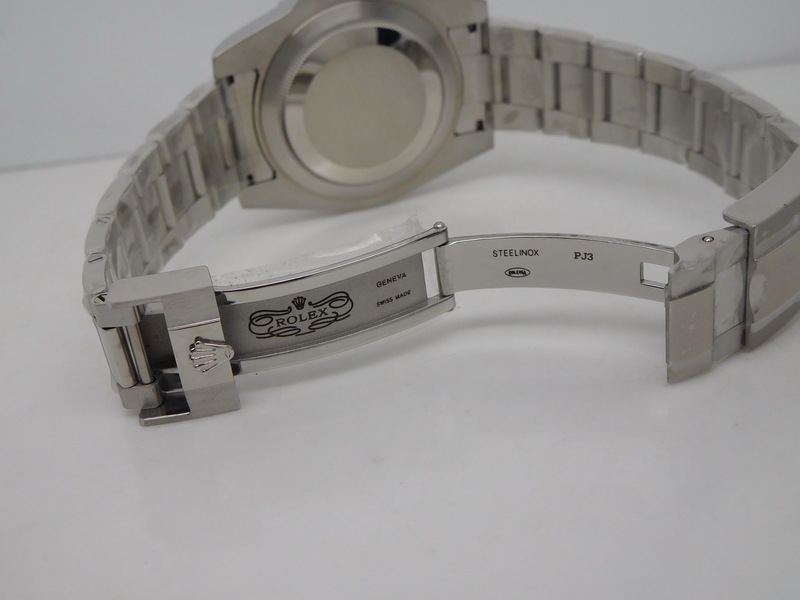 The next three watches are all made by ZF. 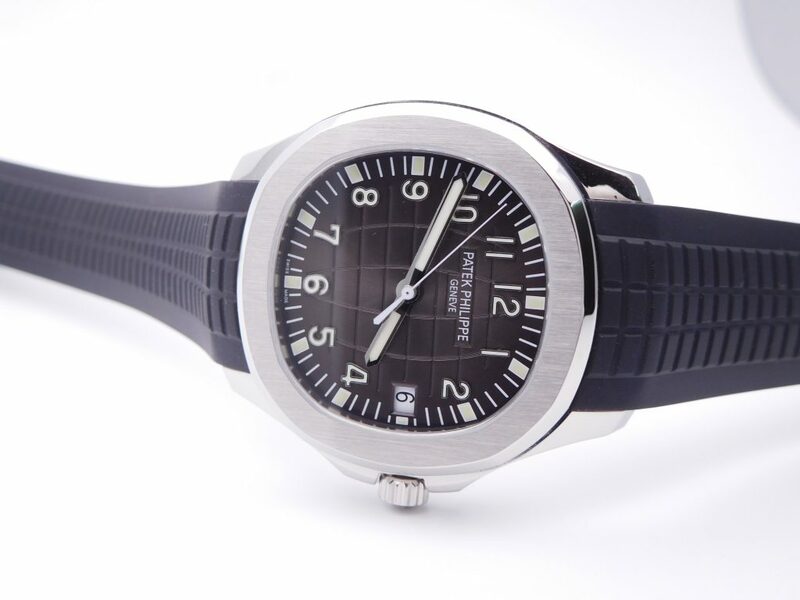 You think Patek Philippe Nautilus should rank at this position, but I do not agree. 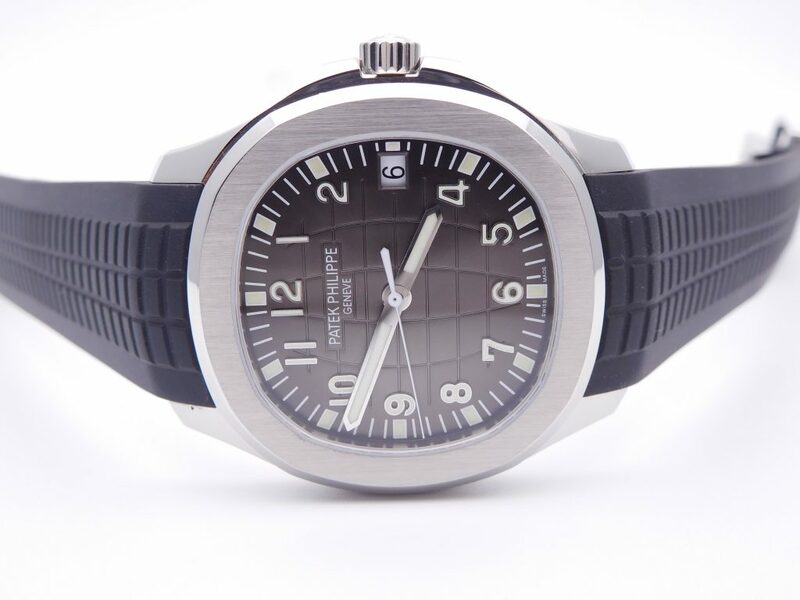 The replica PP Aquanaut 5167 made by ZF looks closer to genuine than Nautolus. This watch has several options in dial and strap color. 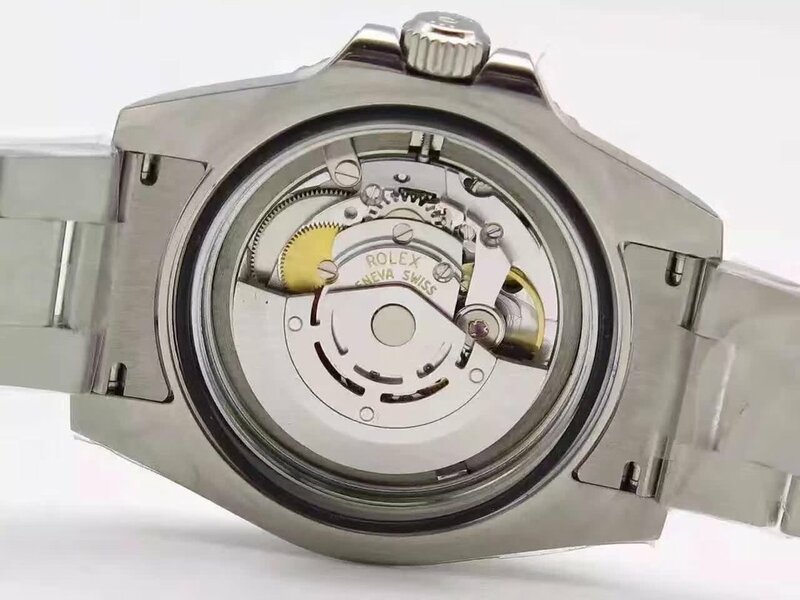 This is a replica with a see-through case back, but ZF has used a Miyota 9015 as a based movement, to decorate the auto rotor and plates, so it has a very close outlook to genuine PP Cal. 324. 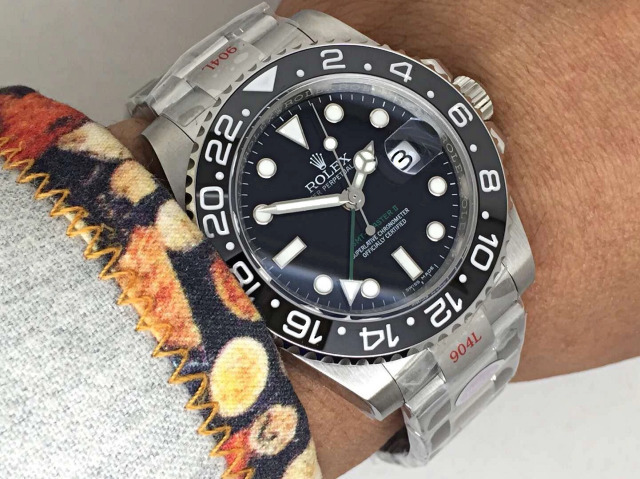 ZF is the overlord in imitating Tudor Black Bay watches. 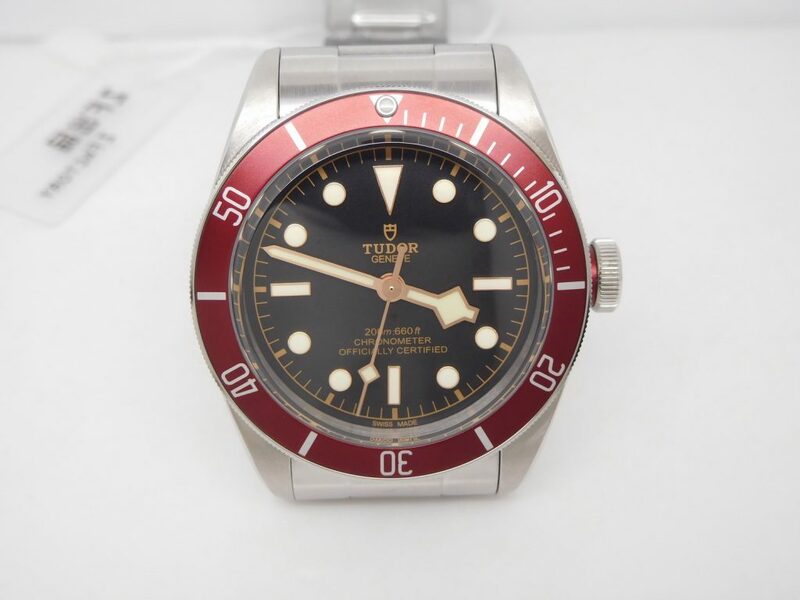 This factory makes the best replica Tudor Black Bay. 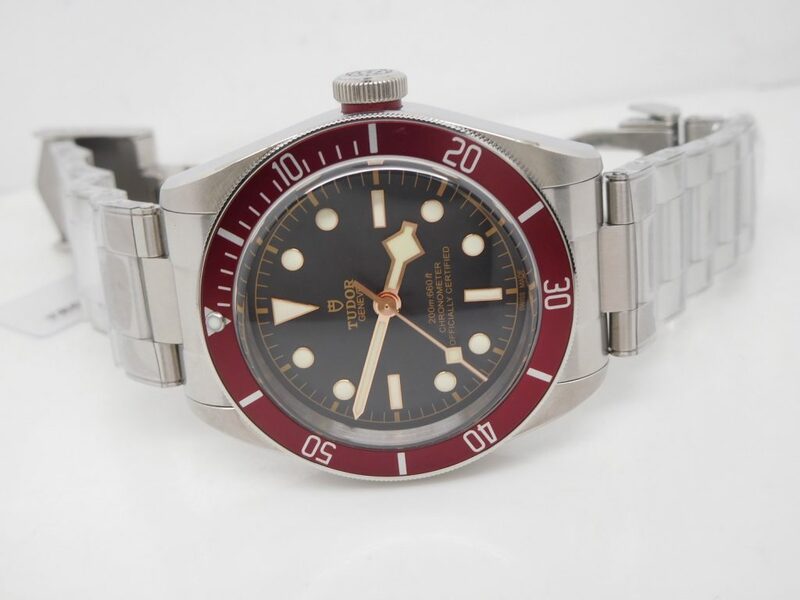 This one with a metal red bezel is the hottest replica among all Black Bay models. The following is its specification. 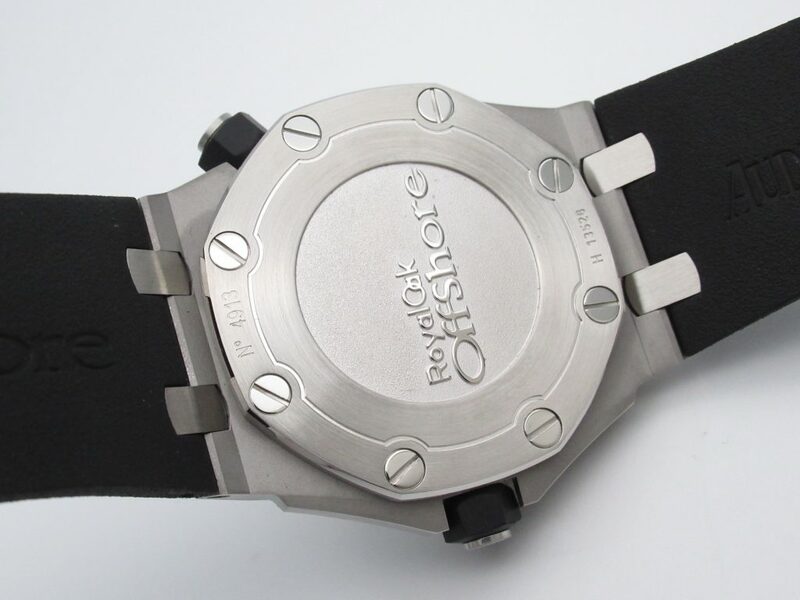 This watch sells very well, a lot of clients from Australia and Singapore bought this watch from me. 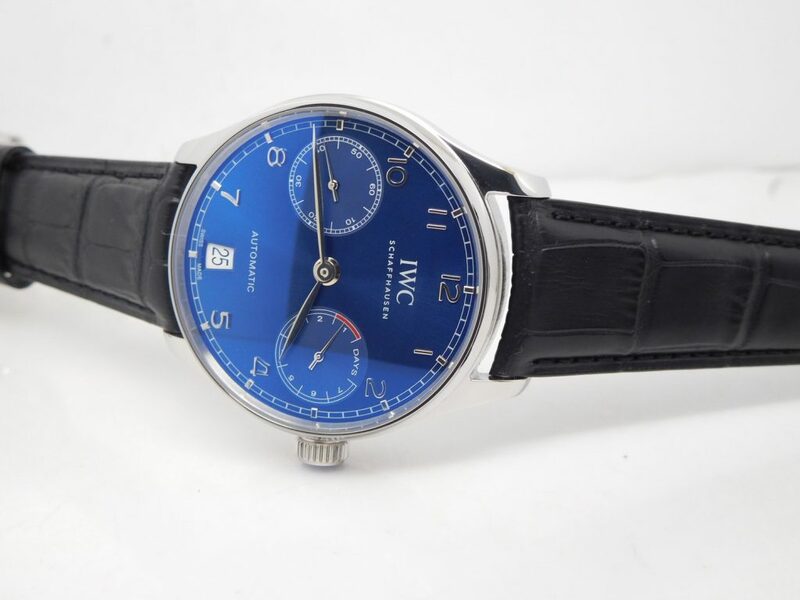 ZF made the best IWC Portuguese 7 Days Power Reserve replica watch, first, the power reserve indicator is working, second, the power reserve has reached to be 3 days, although not 7 days like real, but the watch can work for you at least 3 days after being fully wound. 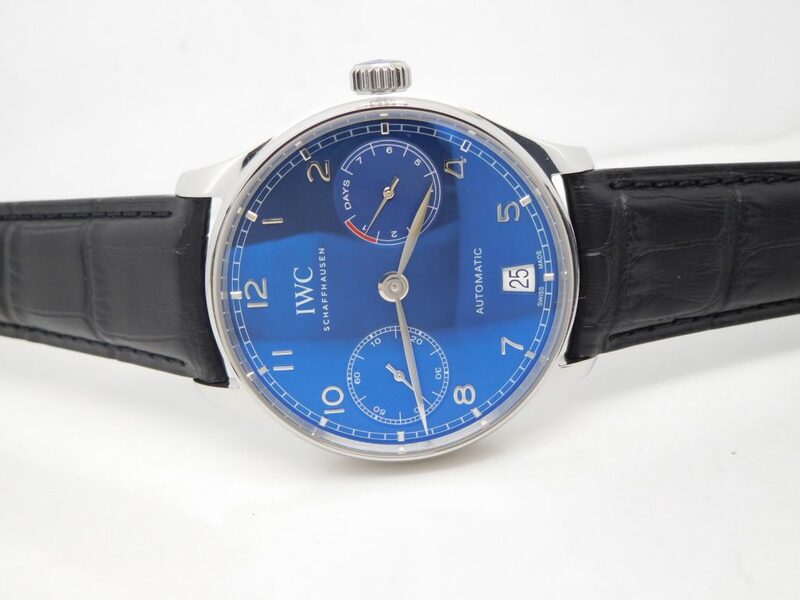 It is a perfect dress watch for a lot of men who need to wear for a formal occasion. Portuguese 7 Days Power Reserve has a lot of models, the dial has blue, white and black color options, the case has white stainless steel, yellow gold and rose gold, while the leather band also has several choices in color. 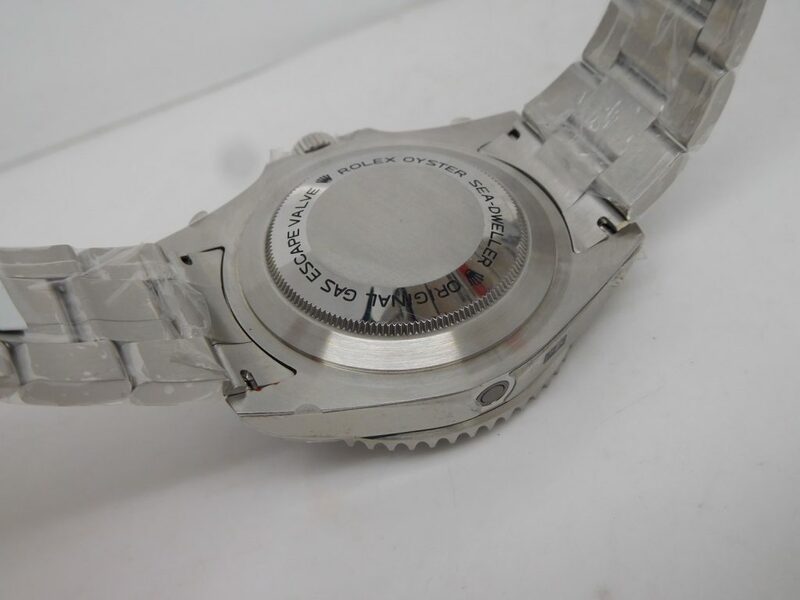 The following photos are showing popular model IW500710. 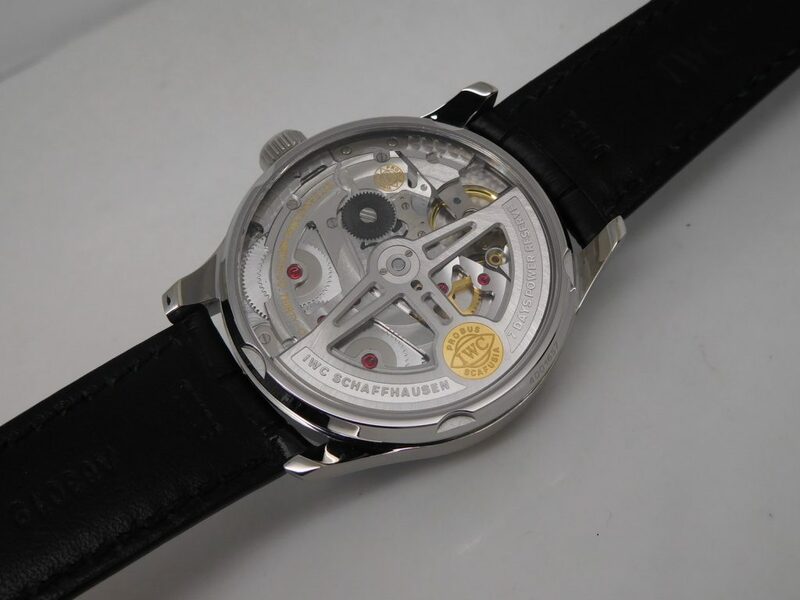 It is the latest replica from ZF, with a super clone 52010 movement. 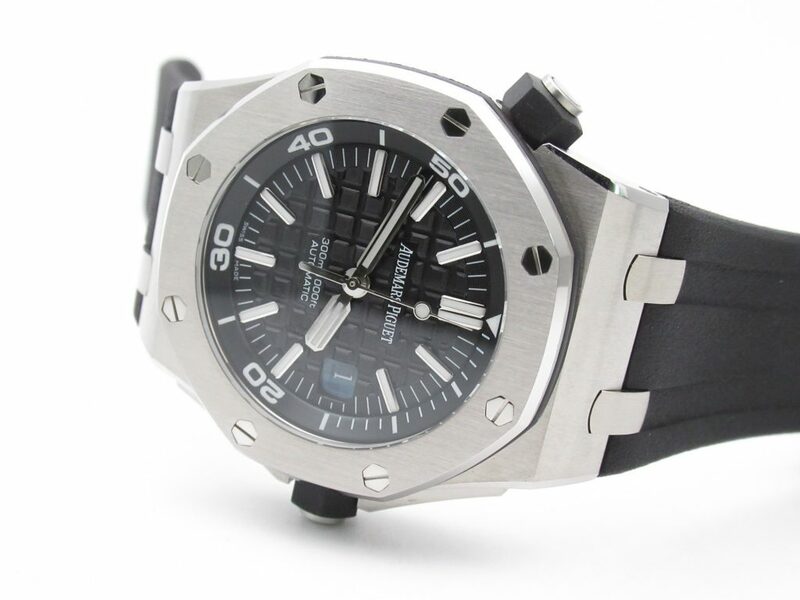 This is my own top ten replica watches in 2018, every one has different opinion, you must also have a different top ten list, if so, please share your top ten watches with us in comment section. 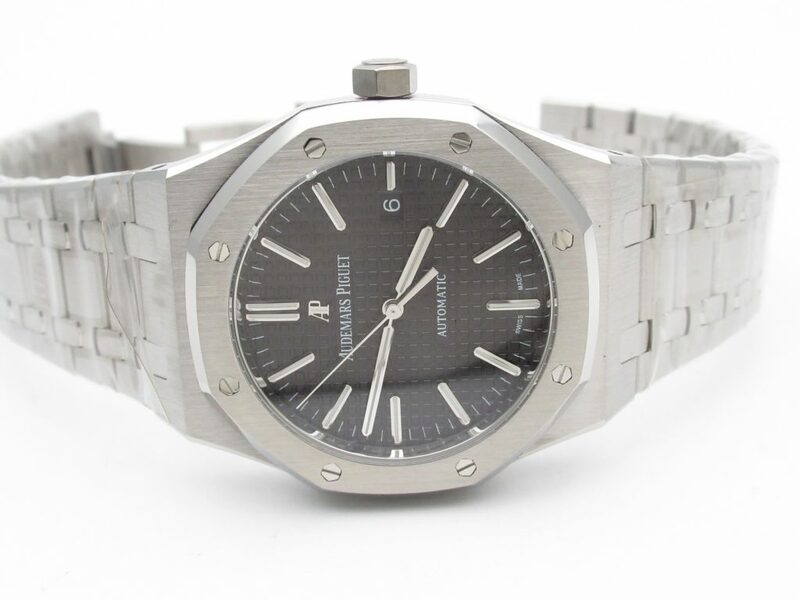 Actually, except those watches above, there are a lot of other replica watches that are in high quality and sold well, we can not list all of them here. 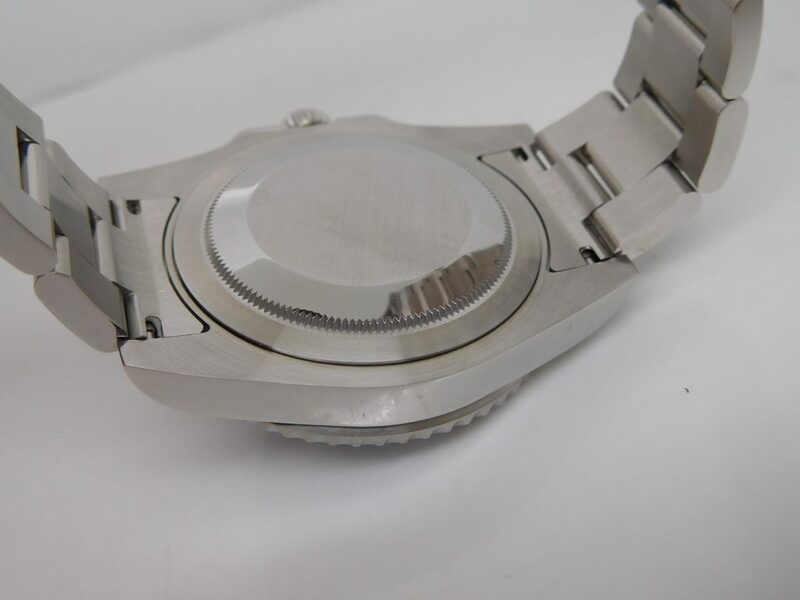 Now, it is nearly the beginning of 2019, we hope that manufacturers will bring us more amazing replica watches in the coming new year. Thanks for reading my review. 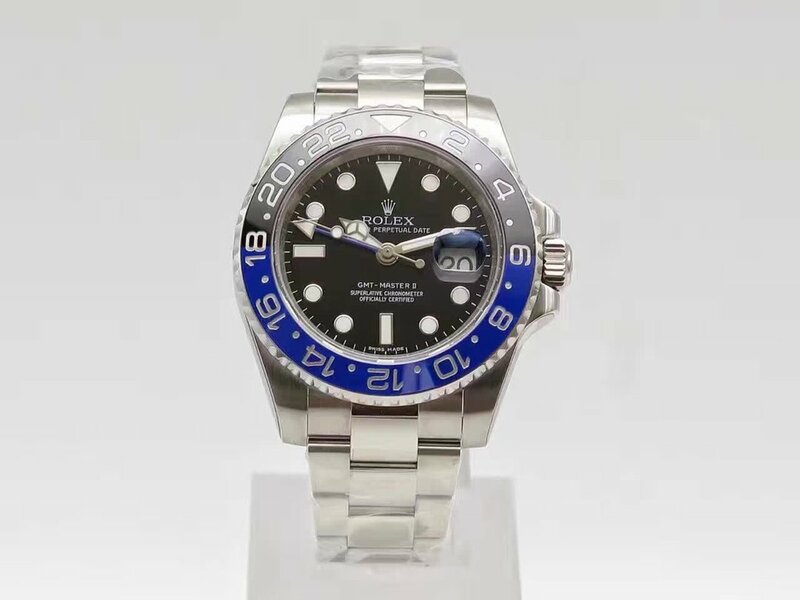 In 2018 Baselworld, Rolex published several amazing watches, which include this GMT Master II Pepsi. 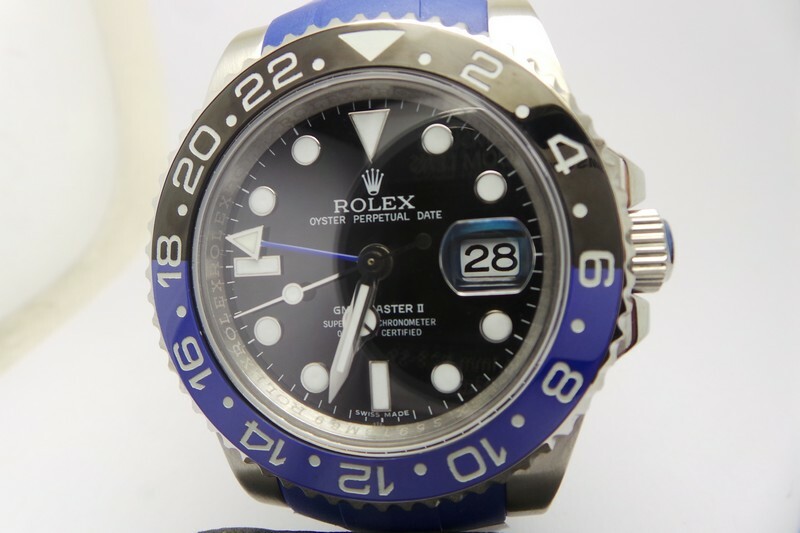 Its reference number is 116719BLRO and features a new dark blue dial. 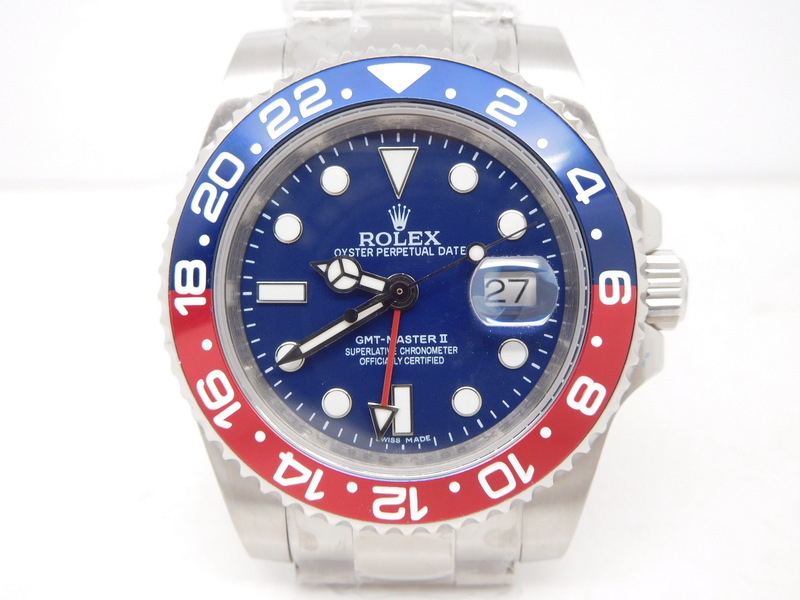 Blue/red bezel is classic Pepsi style, I only saw such type of bezel on those vintage Rolex GMT Master watches. 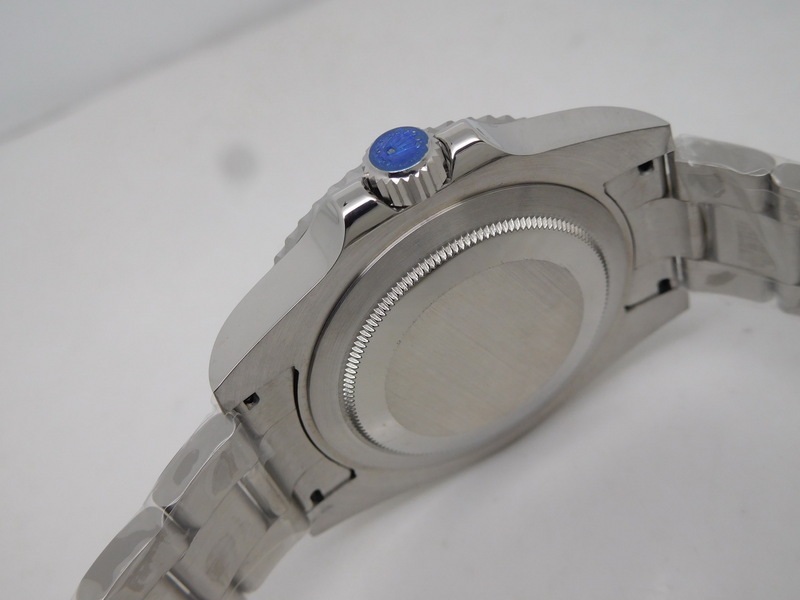 Now, the new blue dial just echoes with the blue color on the bezel. 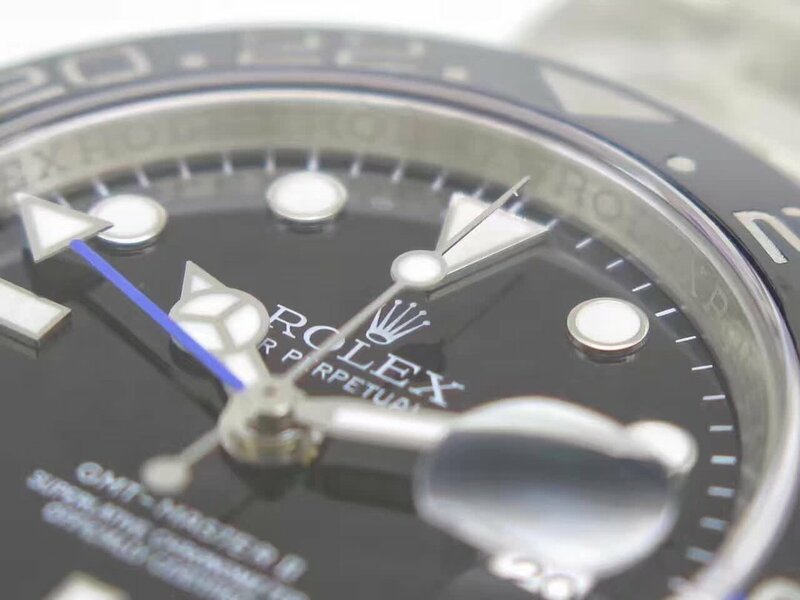 The dial is blue, rather than black, while this makes the watch have modern sense. So, in my opinion, this new GMT Master II is just an art fusion of vintage and modern design. 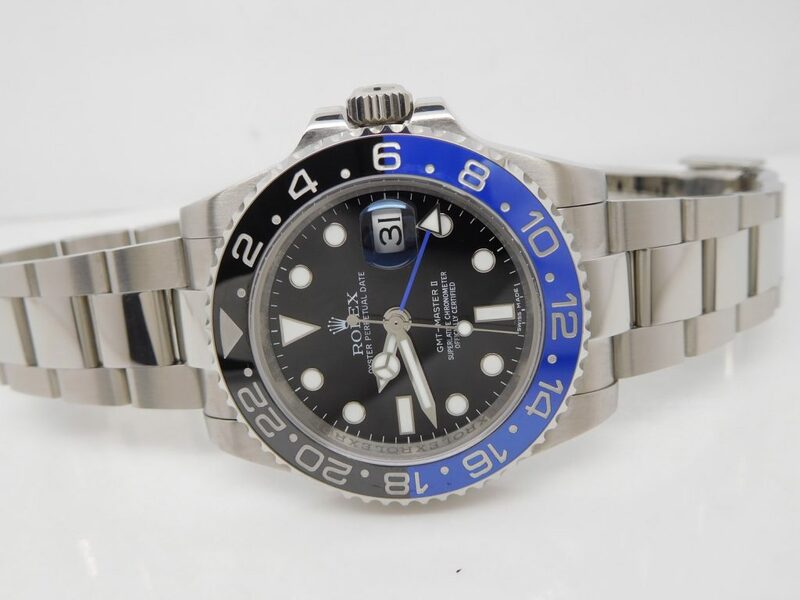 The replica 116719BLRO is a moderate quality watch, it was just produced by an unknown factory, the replica has a big advantage, that is it is sold at a very low price, just like some Rolex watches published by BP factory, which are sold at low prices but have a good quality. 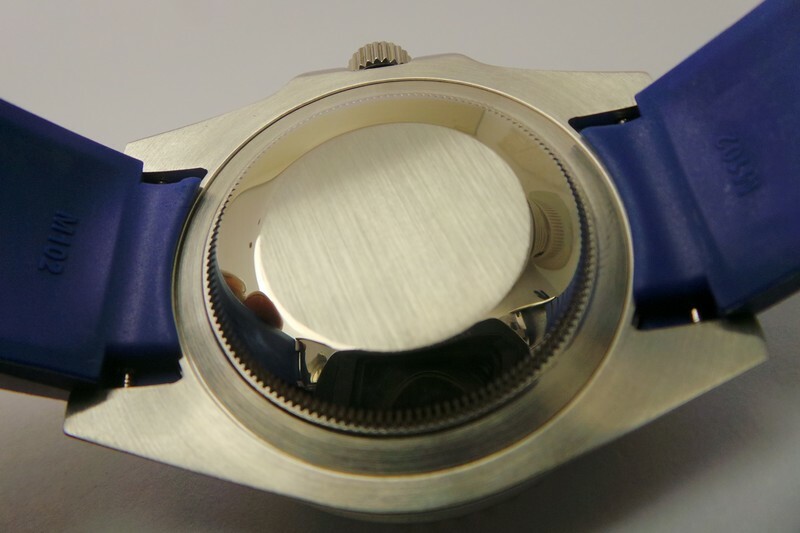 The case is 40mm in diameter, it is brushed on front face while polished on sides and edges. 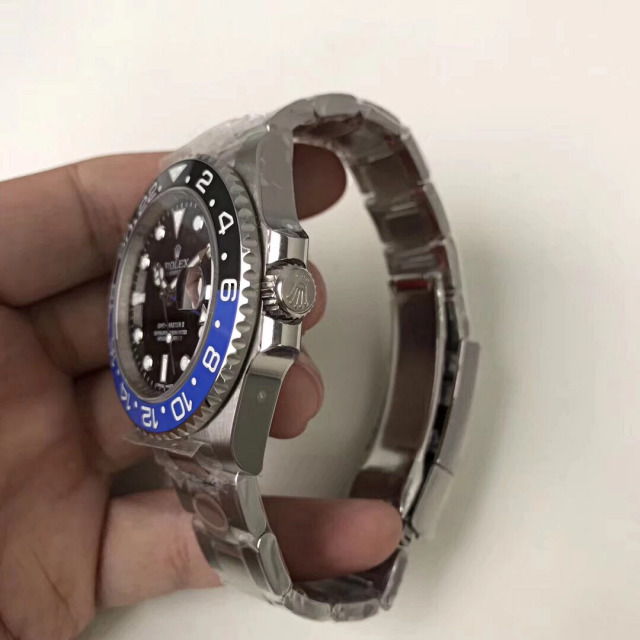 One piece of 316L stainless steel is molded to the case profile of Rolex GMT Master 116719BLRO, it is 1:1 molded according to original, the case diameter and thickness are completely the same as genuine, so the case parts on replica could be interchanged with genuine watch. 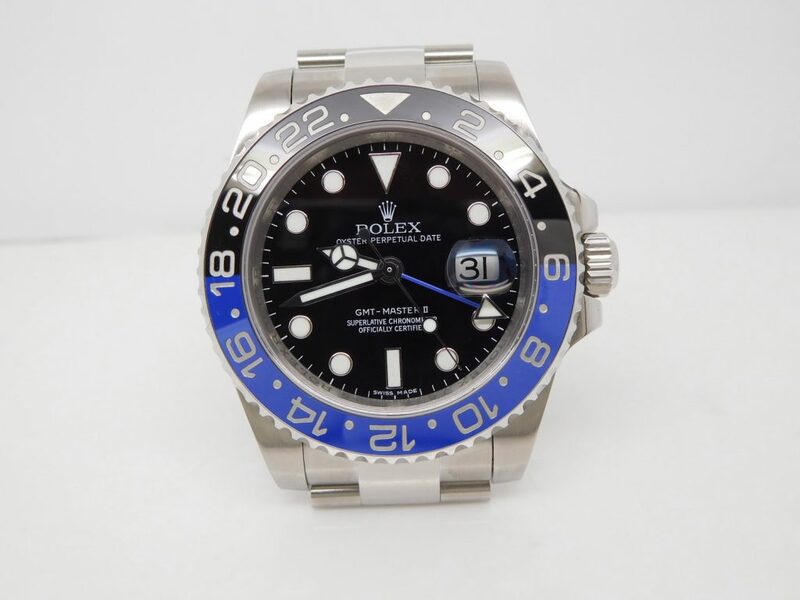 The bezel is my favorite bi-color bezel, we also call it Pepsi because there are red and blue colors. 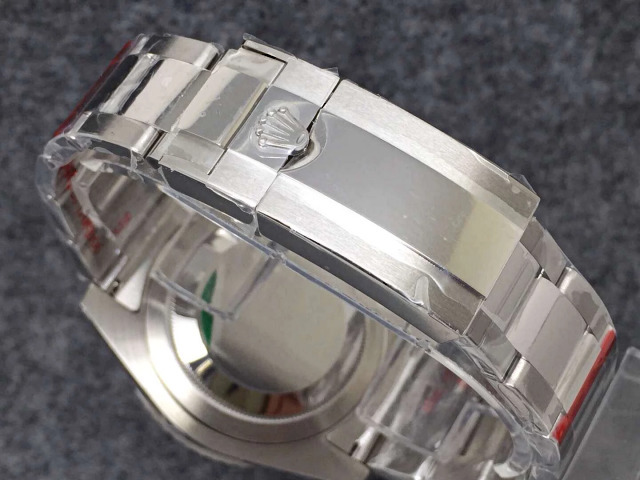 However, the bezel on this replica does not use ceramic, it is just a common metal bezel. 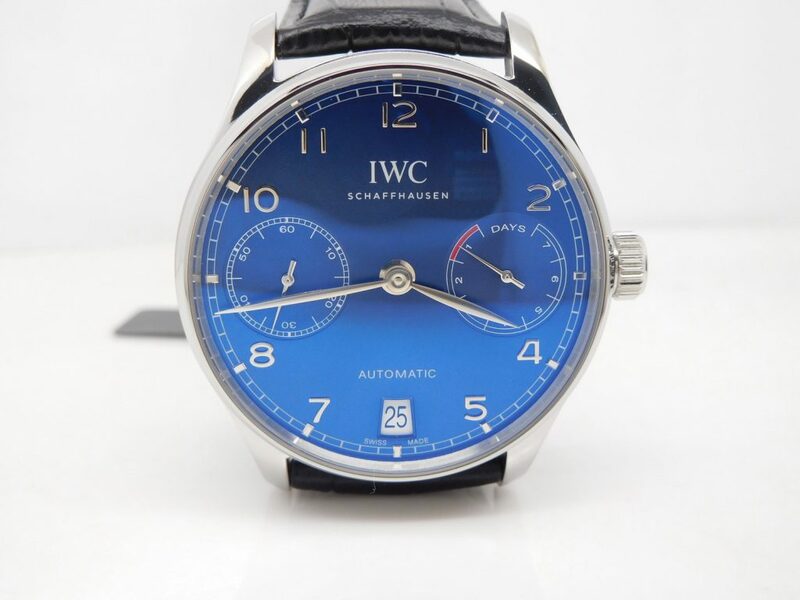 The dial is in blue, all hour markers and hands are applied luminous material, which will emit blue light in the dark. 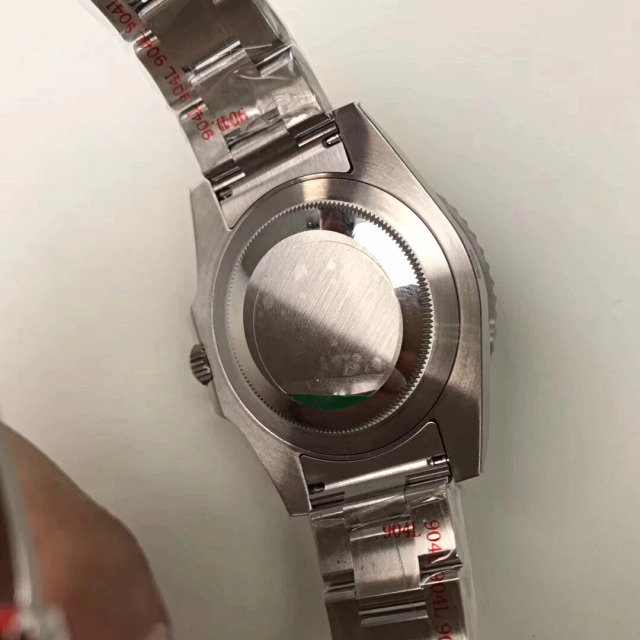 There is a GMT hand in red with a silver arrow tip in the center, the GMT hand is real, it works the same way as that on genuine Rolex GMT Master. 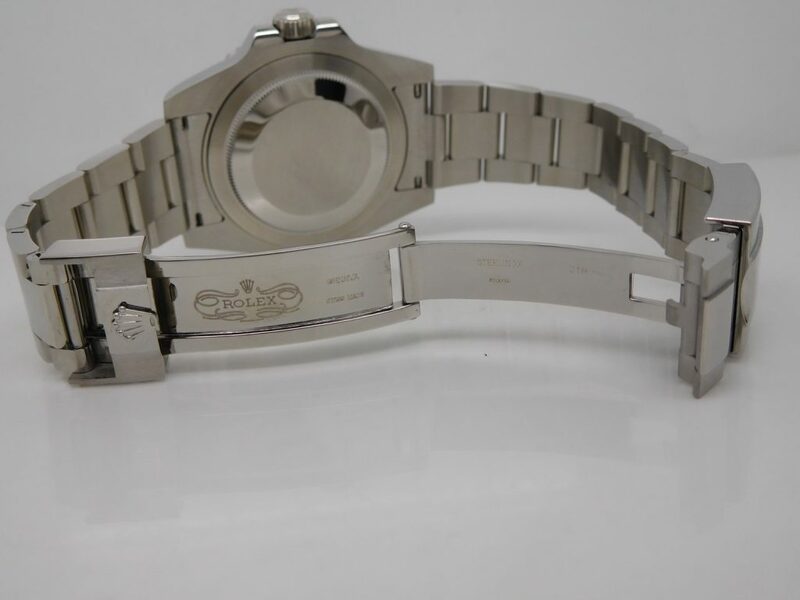 Inner bezel features correct Rolex Rehaut engravings. 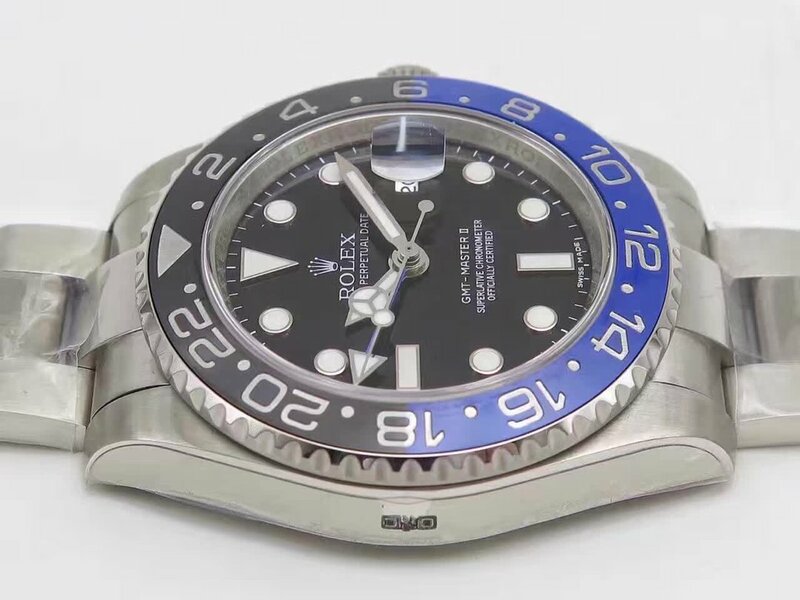 The replica Rolex has a date function, a window displaying date is positioned at 3 o’clock, the white background is very obvious in blue dial, you can read the date clearly from the dial. 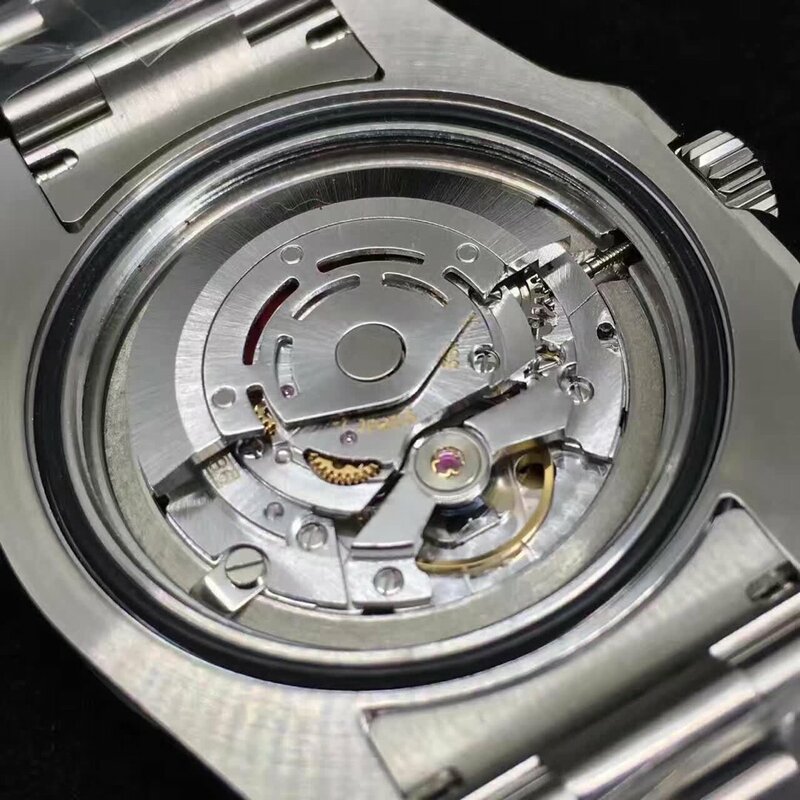 At last, it is the movement inside, which is an Asian ETA 2836 automatic, the Chinese movement is modified to outlook of golden ETA 2836 movement, it offers real GMT function to the replica watch, timing and date are also very accurate. Today, there are a lot of super clone movements in our market, but in my opinion, they are not as stable as this famous clone ETA 2836. 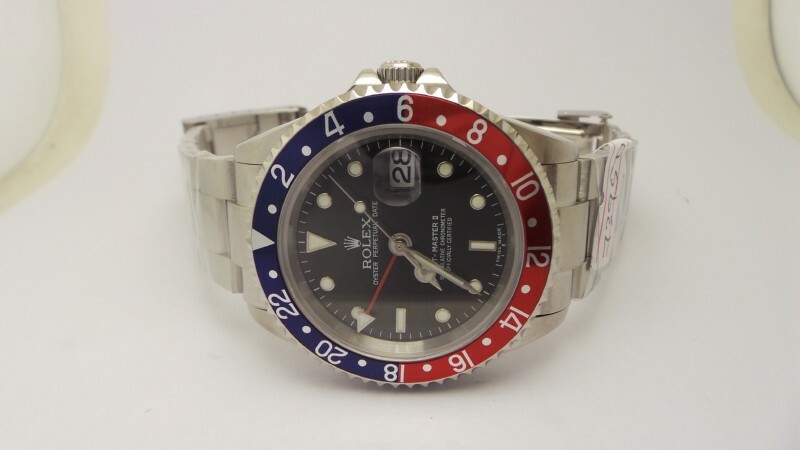 Genuine Rolex GMT Master II Pepsi is sold at a sky high price, so, why not buy a replica ahead of your friends and give them a big surprise. 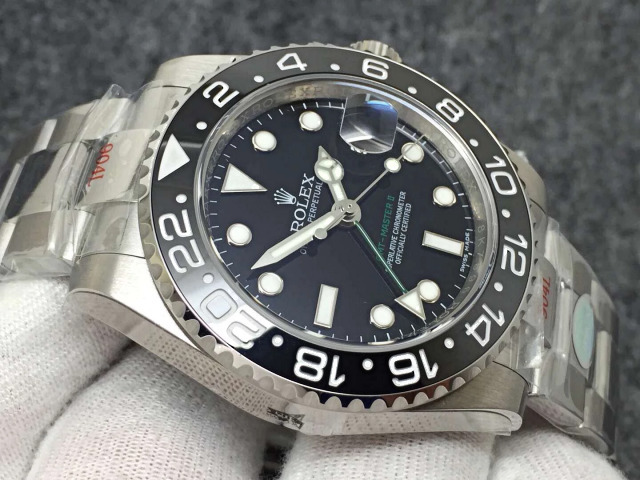 The best replica Rolex currently in the market must be manufactured by Noob factory. 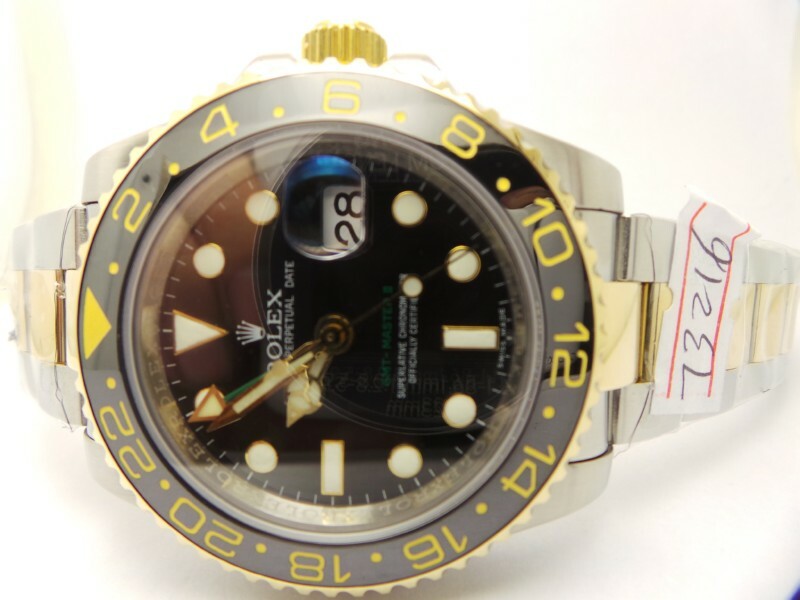 Besides the wrapped gold Rolex from Chang Rong factory is also good, but much more expensive. 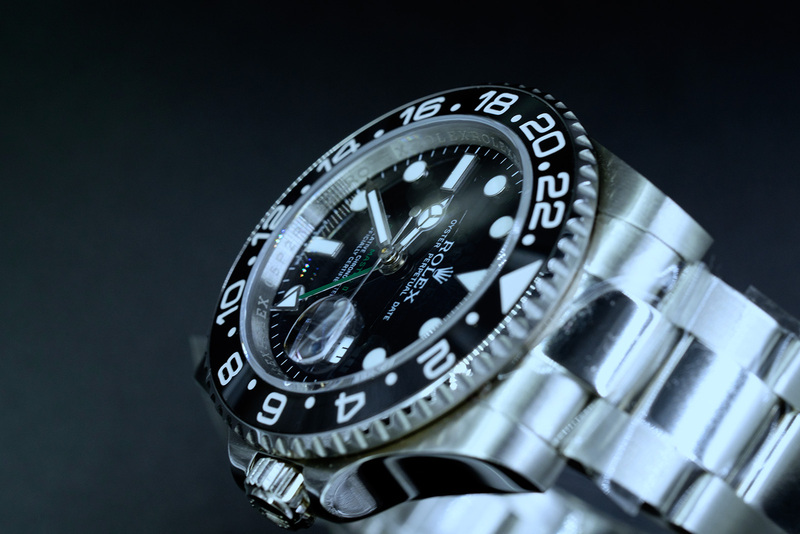 Super A Rolex from N factory have four models, they are Submariner V4, new Sea-Dweller, GMT Master II and Explorer II. Green Milgauss is also in Super A grade, but not as good as these free. 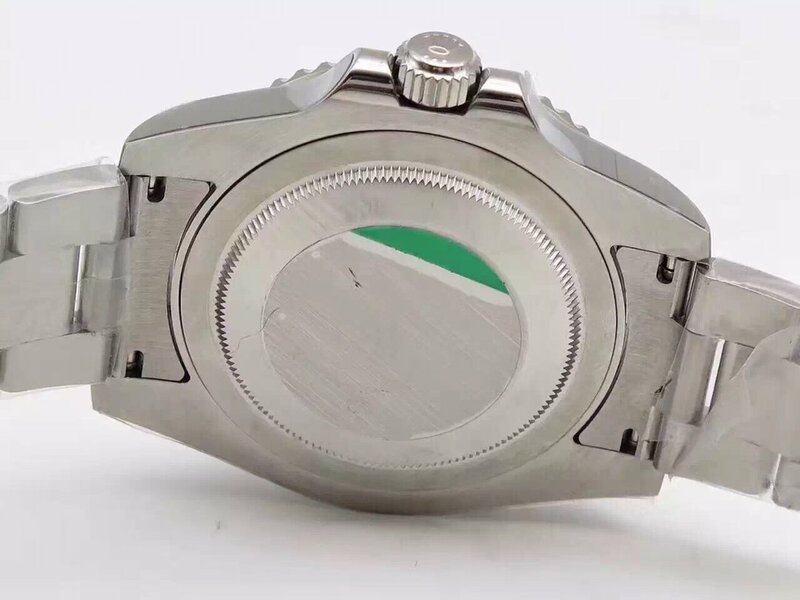 Noob Submariner now has several versions, the historic V1 and V2 have some problems, their hour hand is not pointed, this defect was modified on V3 and V3.5. 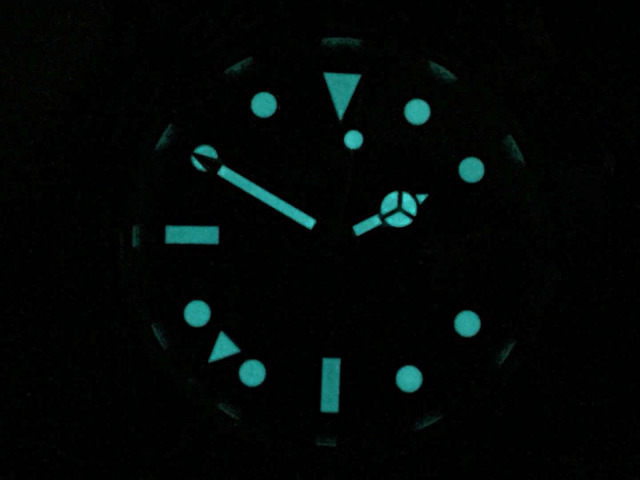 Now V4 Sub is currently the best version, it modified inner bezel reference and bezel markers, but the “f” letter is still longer than genuine on black Submariner, while green Submariner is correct. Sea-Dweller does not have versions classification. 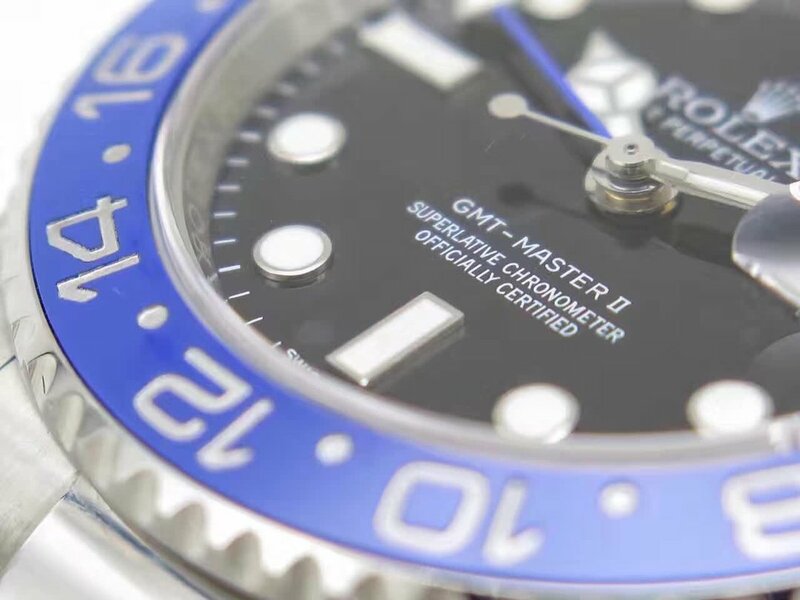 This GMT Master II is not sold as well as Submariner, many people do not want to buy it because of its incorrect green hand position, but you can deny this GMT 2 has a good craftmanship. 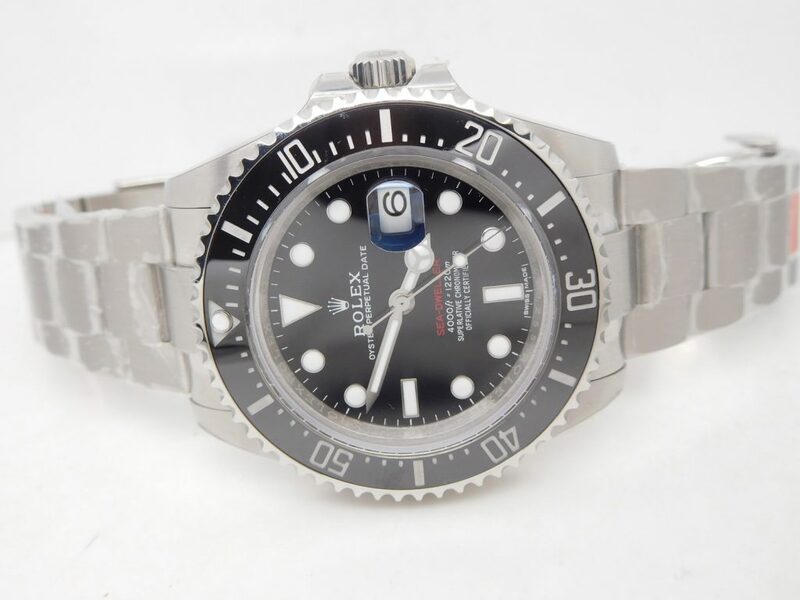 Compared with Submariner, all Arabic numbers on bezel make this GMT have a better visual effect. 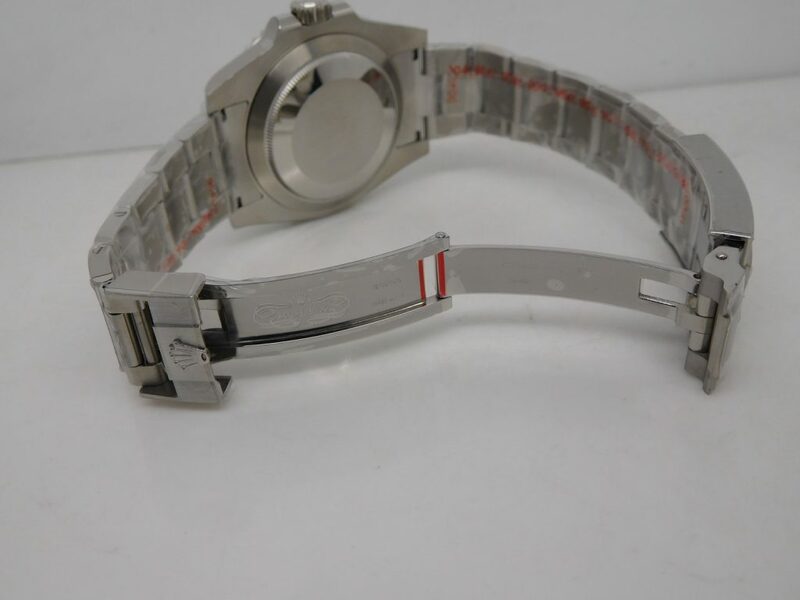 The same is the two watches all use real ceramic, laser engravings and white painting. Dial printings are also different. 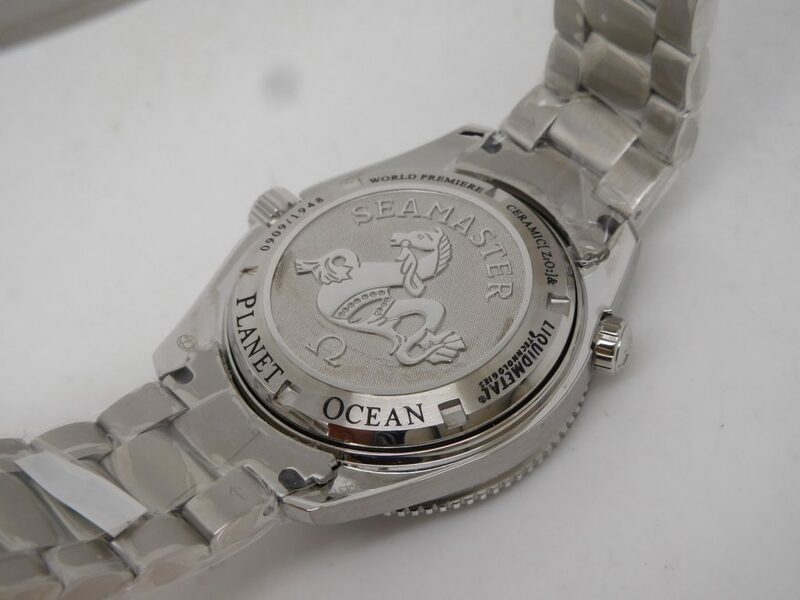 Besides, Submariner uses brushing on central links, while the middle links of GMT are polished. 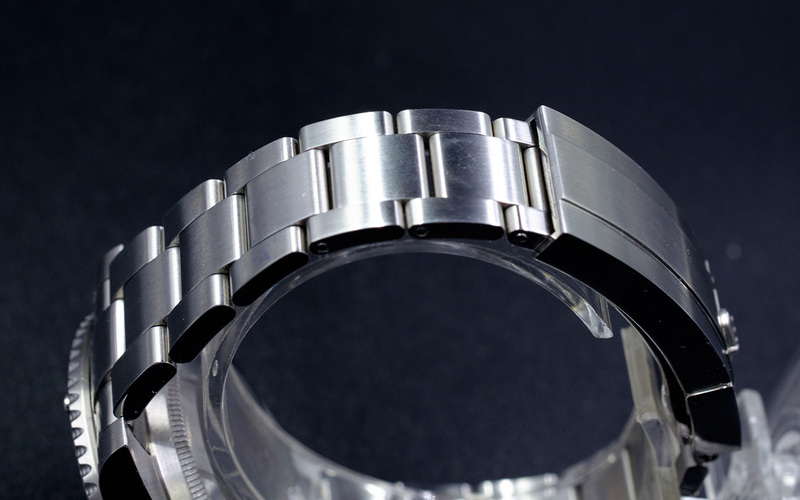 The middle links on GMT bracelet are polished, looks very beautiful and in a highly contrast with the brushed links on both sides, so the bracelet of GMT Master II looks more refined. 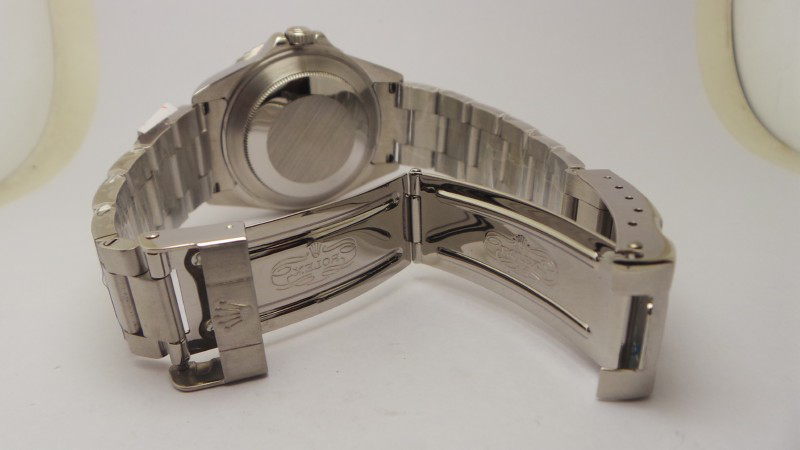 The case of both watches share the same process, their case side is polished, like a mirror. 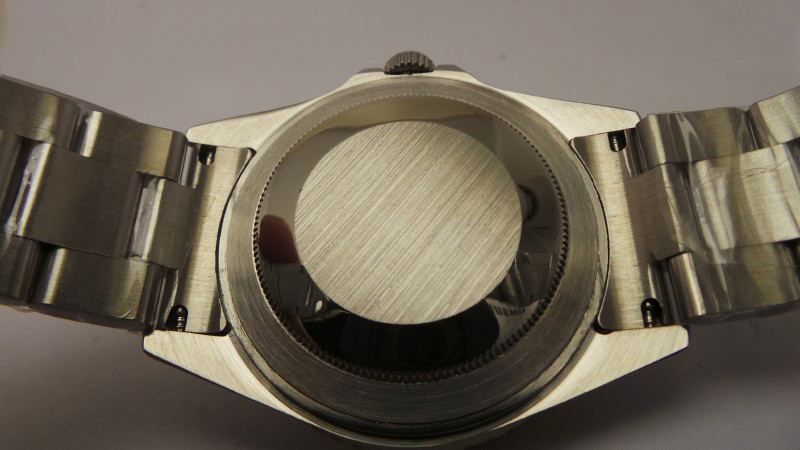 Bezel tooth is done well and gives a good hand feel when rotating. 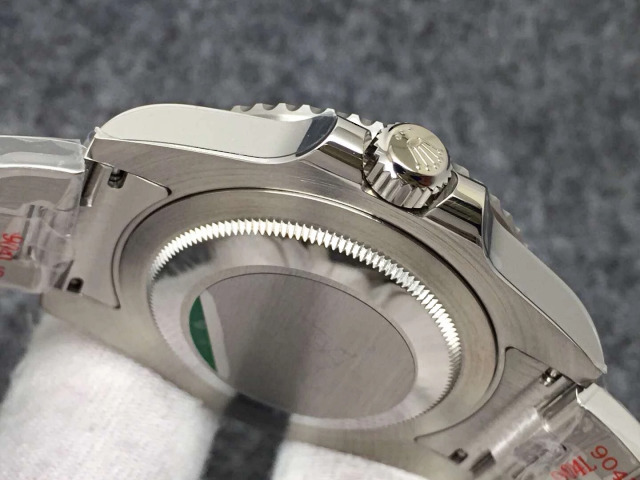 Please note that GMT bezel could be bi-directional rotating while Submariner’s could only be uni-directional rotated. 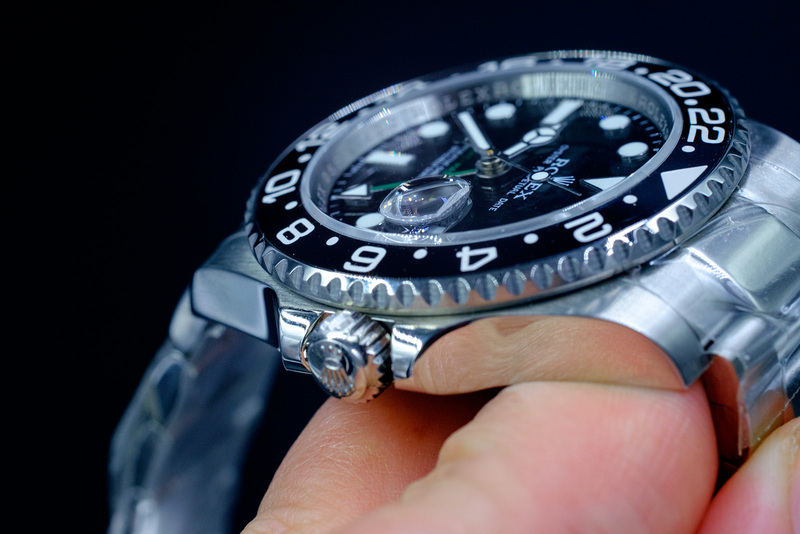 The GMT hand position is different from genuine. 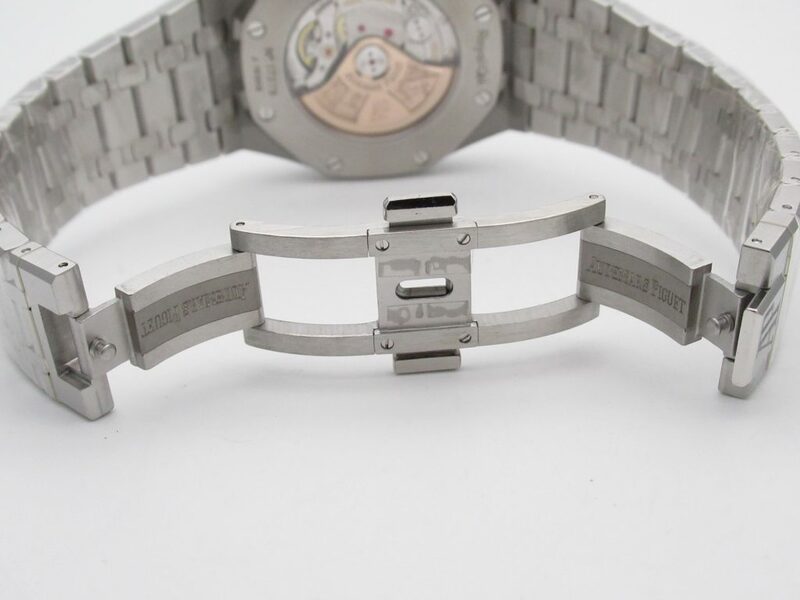 The GMT hand on genuine GMT Master II is between hour hand and minute hand, while this replica’s is on the bottom, close to dial. 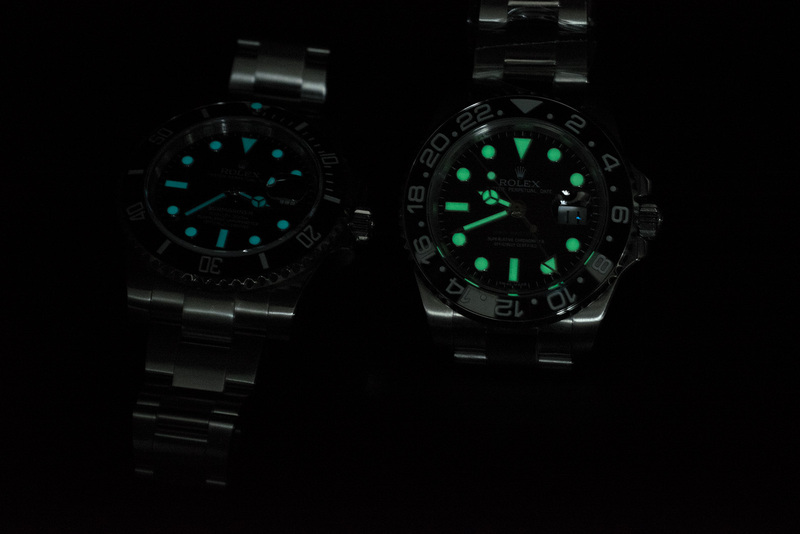 At last, it is the lume comparison, GMT dial lume is green while Sub is blue, this is the biggest difference. 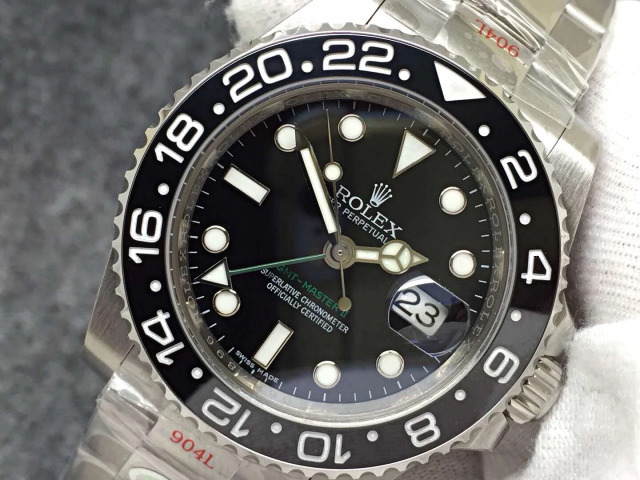 In recent times, I have written a lot about Rolex watches and most of them are vintage Sub and Explorer, they got a great response on my blog, many readers asked how to buy it and encouraged me to written more things about those vintage watches. 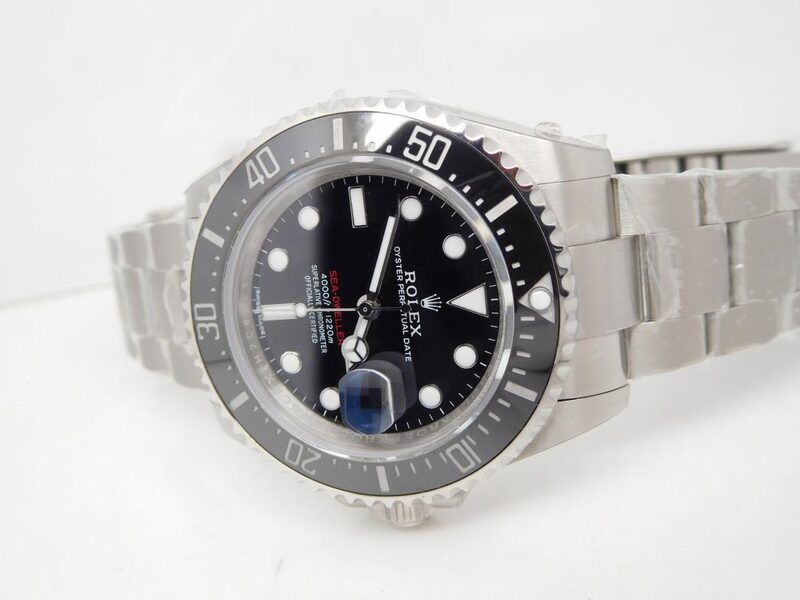 Yes, I will keep doing my work to introduce more fantastic replica watches, besides, all advice I have given to you is honest, there are a lot types of replica watches in the market, each type varies in quality, I just hope you to get the most high-end ones. 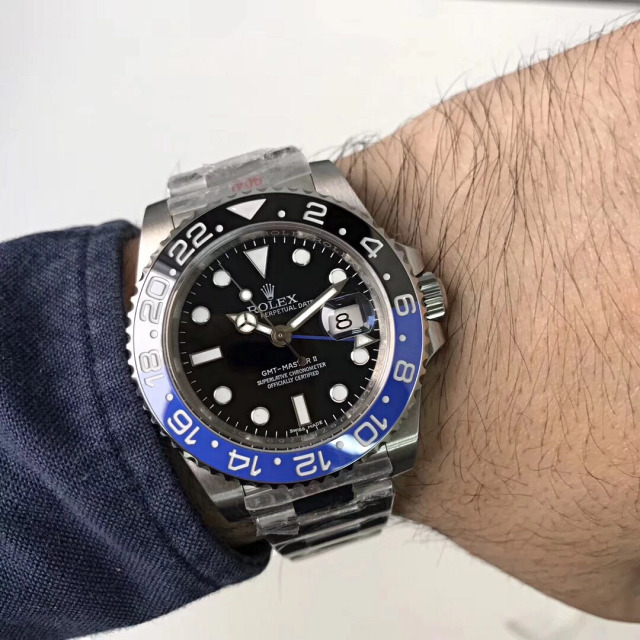 There is one thing I must explain, that is, many people are obsessed with those replicas manufactured by big factories like Noob, BP, J12 and others, but this does not mean that they are the best. 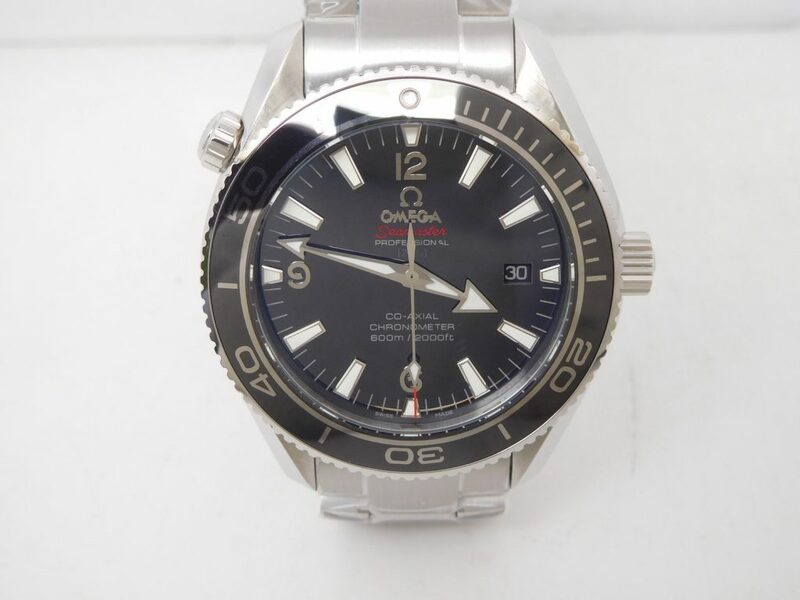 Sometimes a cheap quartz watch will run longer than a Noob Submariner at several hundreds of dollars, every one is looking to get the best one, but you just need to find the one that perfectly fits your style. 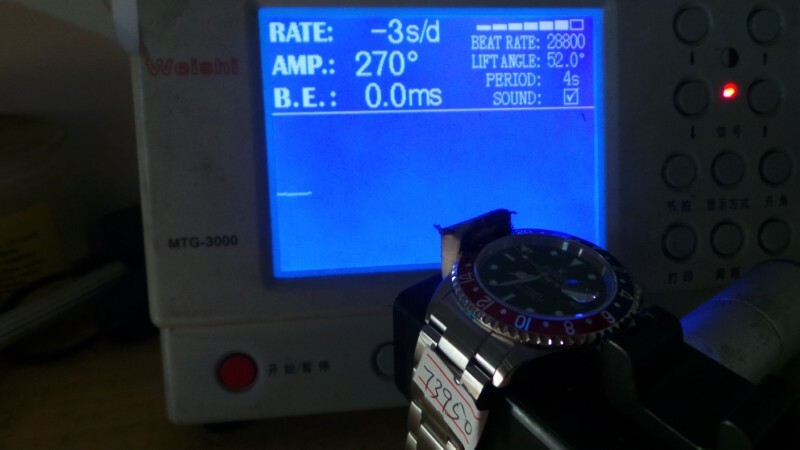 Here comes the two tone GMT Master 2 replica. 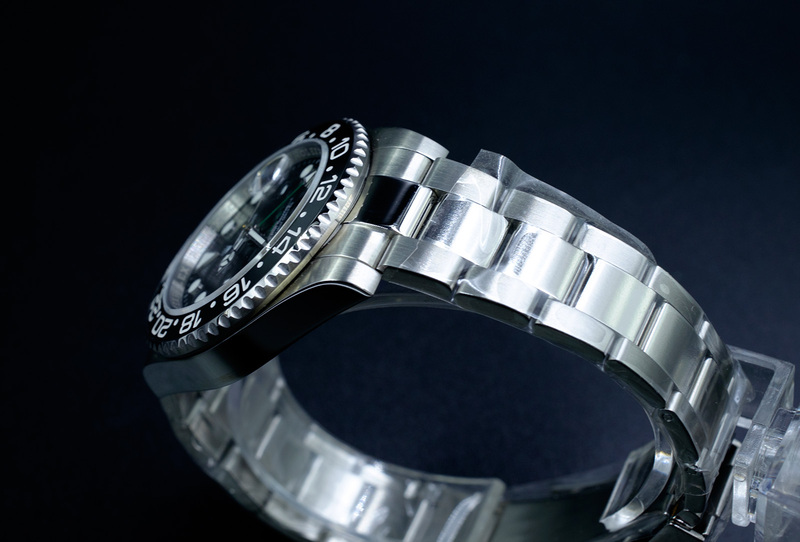 Genuine watch was published in 2008 BaselWorld, in that year, Rolex released a lot legendary models. 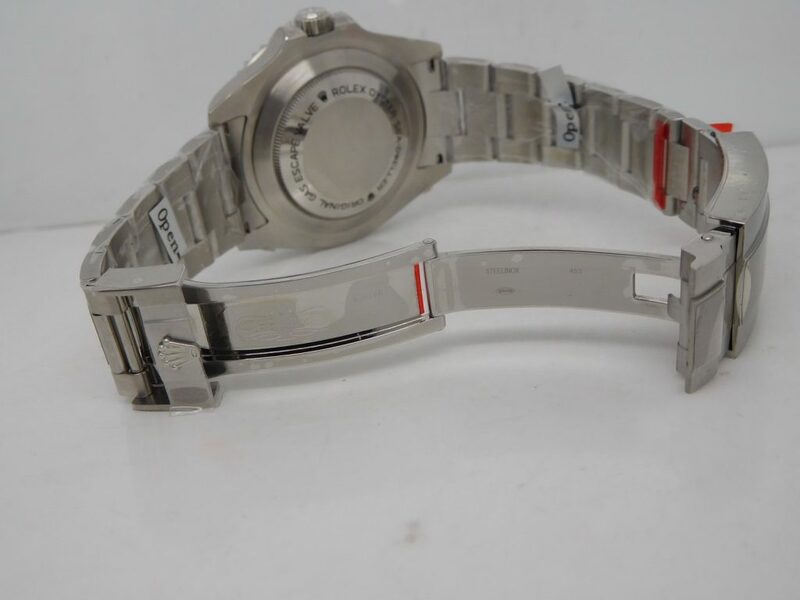 In nowadays market, replica watches are usually improved from two aspects, one is lume, the other is font. This GMT Master II replica not only has an outstanding two tone outlook, its dial lume is also upgraded, the luminescence applied on the hour markers and hands is thick and durable, it is strong green light you can see from the dial in the dark. 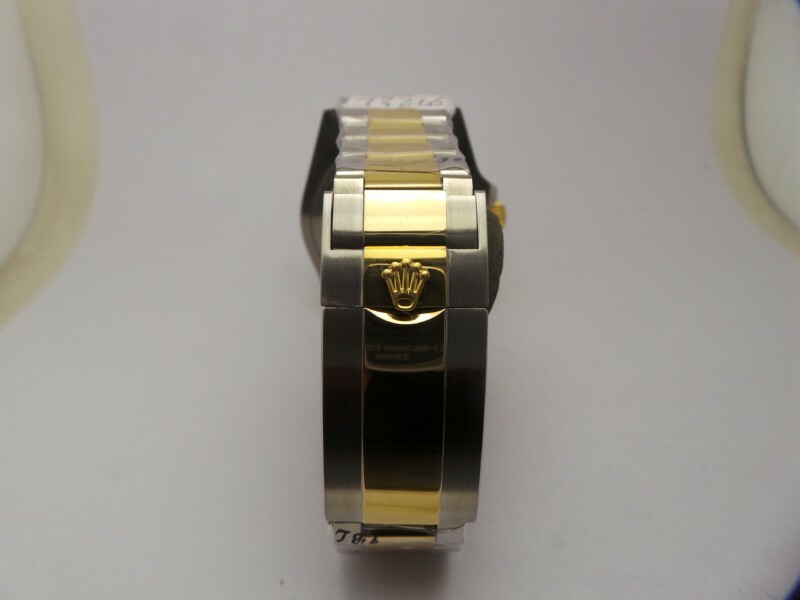 To make it look closer to genuine, bezel font is engraved and in a certain depth, then being painted golden tone. 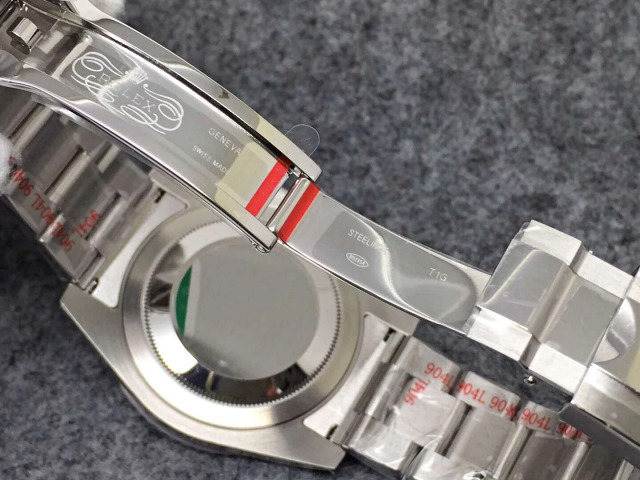 The dial has four colors to separate each detail and give a better visibility. 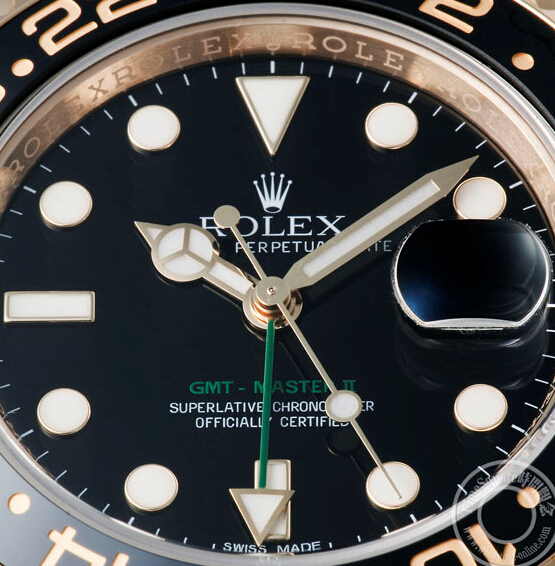 Black main dial matches with golden hour markers and hands, the date window features thick black font in white background, the gmt hand could be adjusted through the crown, it has a green stem that echoes with the green words “GMT-MASTER II” on dial, every part of the replica comes along with the golden color, this makes the watch to be in line with its Two Tone style. 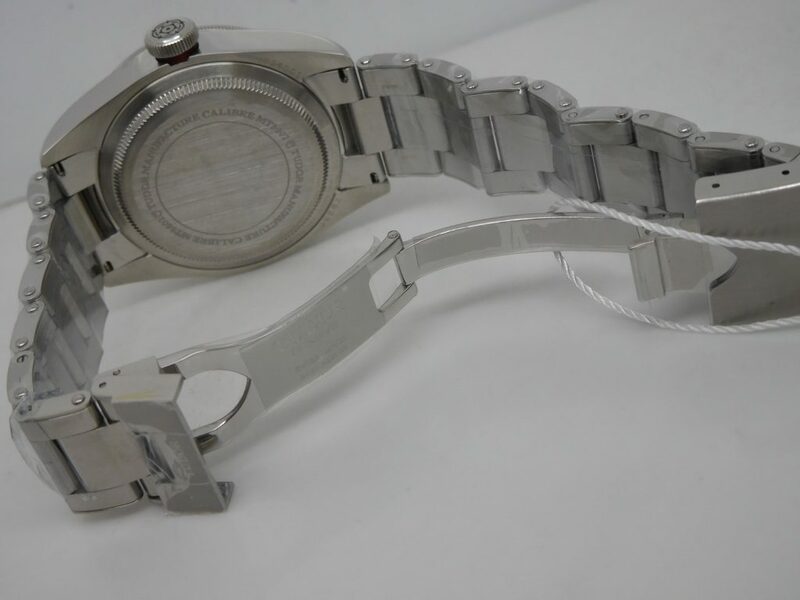 Whatever the size, or watch parts, they are all 1:1 replicated according to genuine, all external watch parts could be exchanged with genuine watch except the movement. 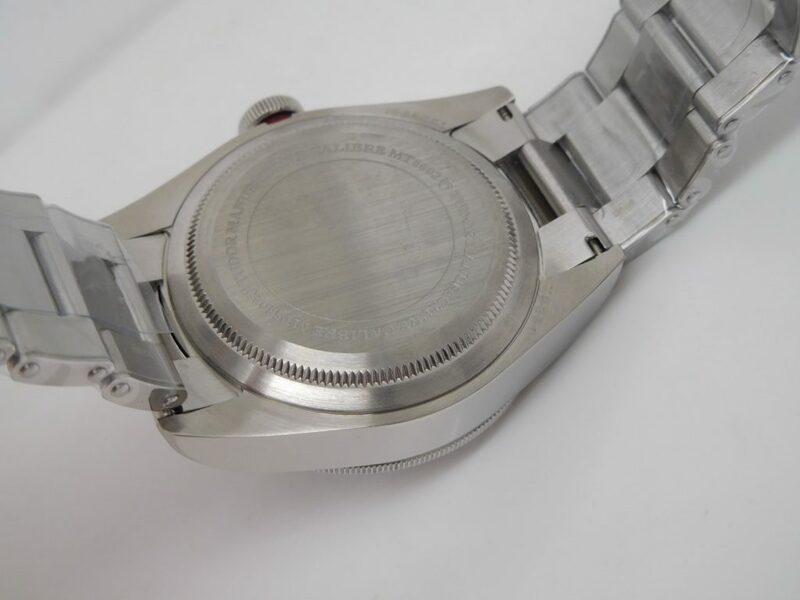 The replica GMT Master 2 uses a high end Chinese automatic movement, which we usually called it Asian ETA 2836-2, this movement may be manufactured in Tianjin, China, the watch factory in Guangzhou bought the movement and modified it to the outlook of Rolex 3187, then they installed the modified movement in the replica. 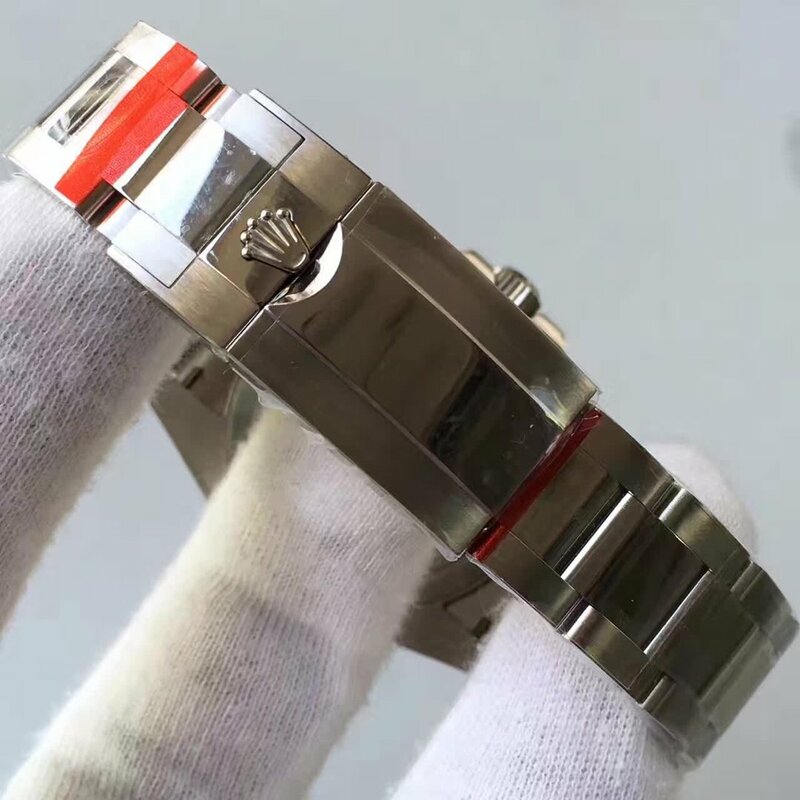 Rolex has always been mostly welcomed in watch industry, it is also one of the most popular replicated watch brands in fake watch market. 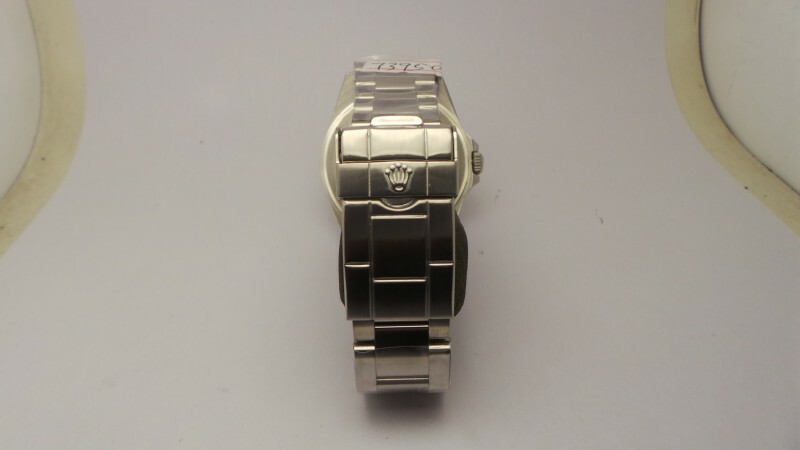 There are different types of Rolex replicas now that are divided into various grades. 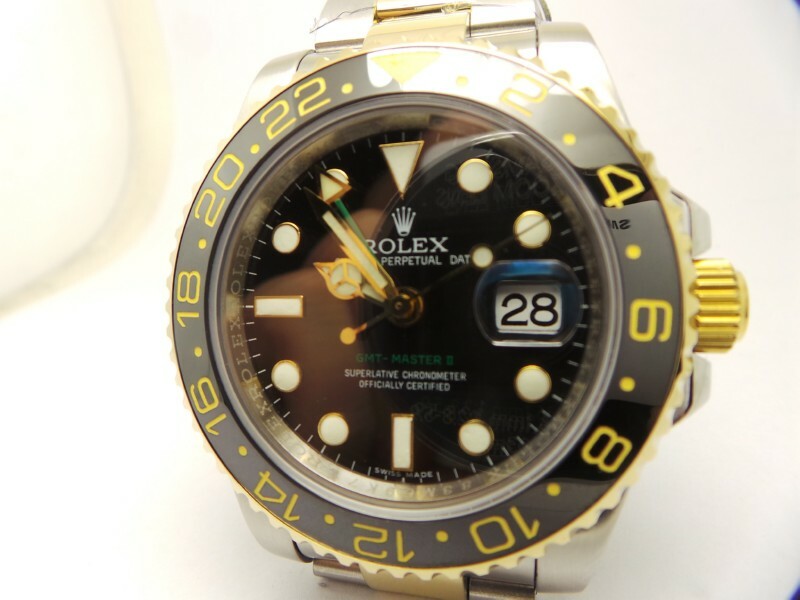 The highest quality replica Rolex watches are manufactured by big factories such as BP, J12, Noob. 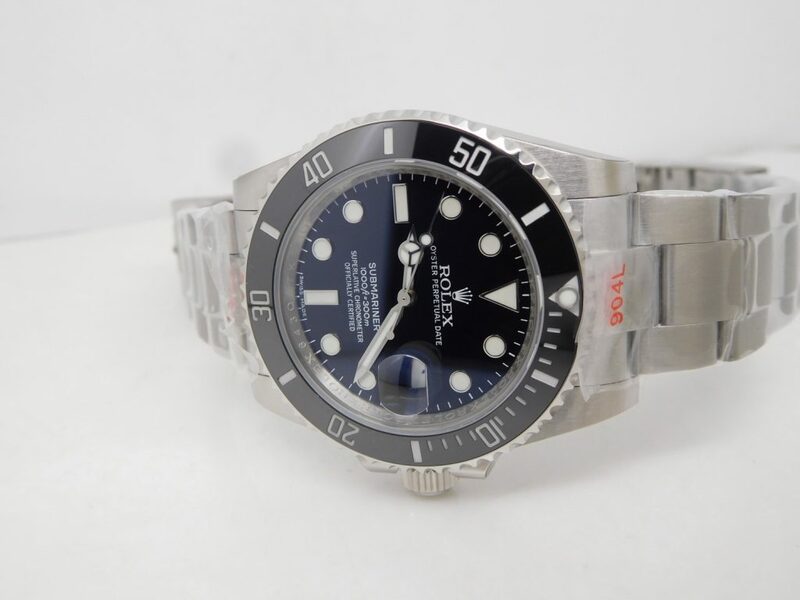 Actually there are many high end Submariner replicas that had been made by Noob factory before, with the progress which replica watch made in technology, more and more factories participate in the manufacturing of replica Rolex. 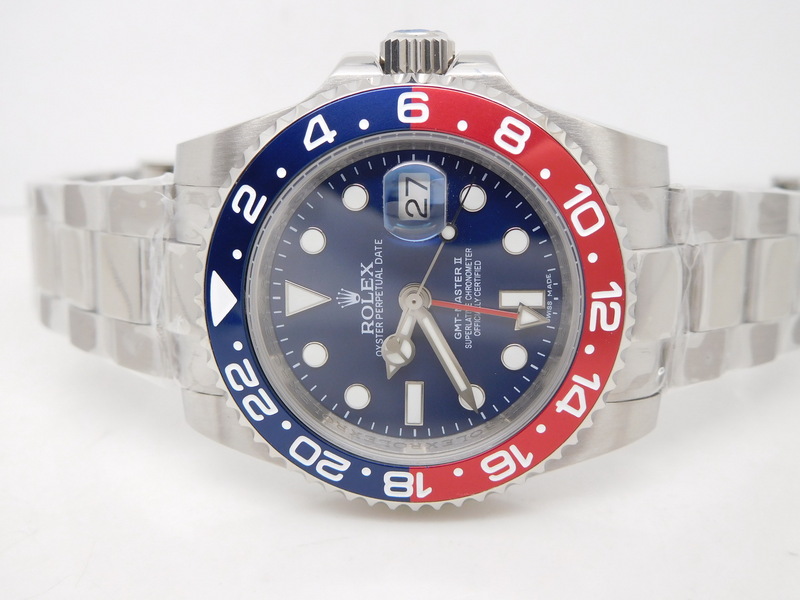 Today, I am going to introduce another quality Rolex watch, it is replica GMT Master II with blue red bezel. 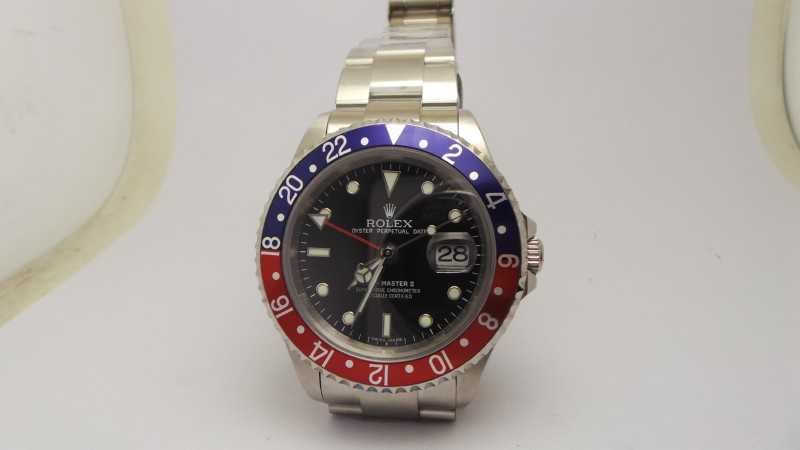 The watch is somewhat full of vintage style, red and blue bezel is classic and could be found on most vintage Rolex watches. They are usually called Pepsi Bezel. 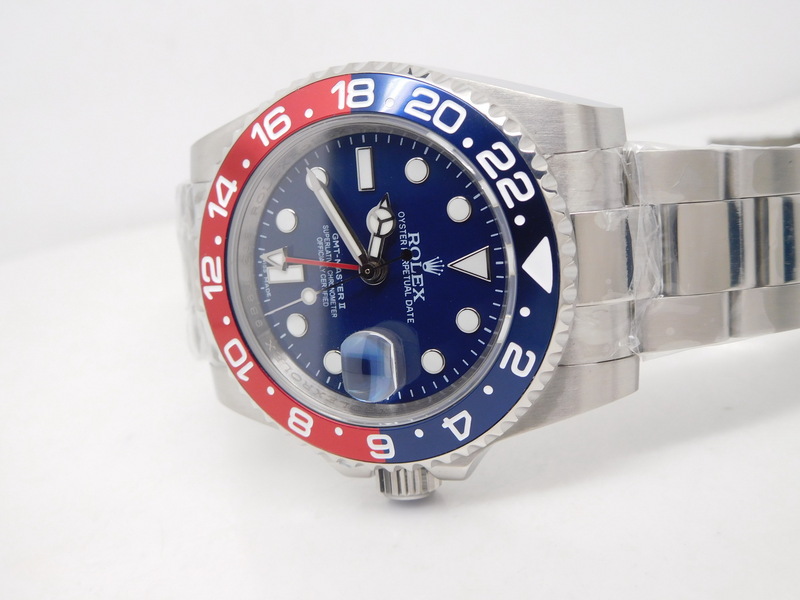 High quality replica Rolex usually has a good textured bezel, especially this one that paints red and blue color, the color junction on the bezel is natural. 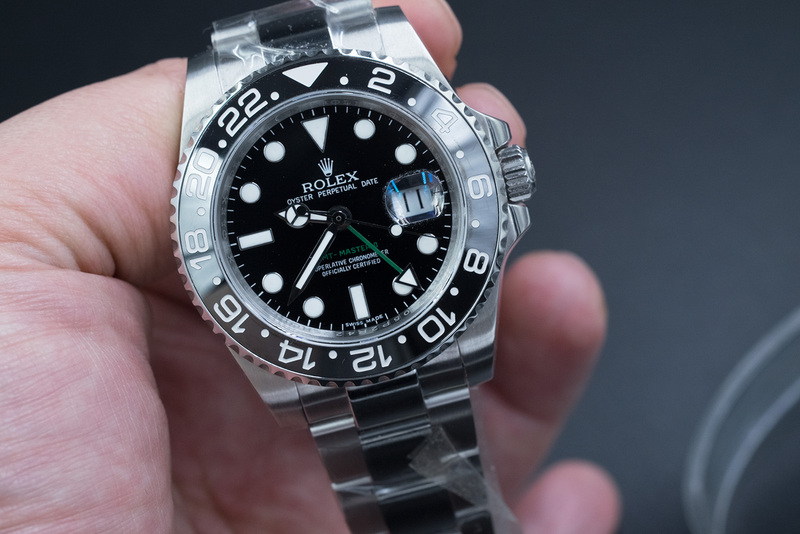 Bezel is the most eye-catching place of the Rolex GMT Master II, while its dial is also attractive, black background with white printing, all hour markers and hands have white luminescence coated. The GMT hand has a wide triangle head and a red stem. Overall, you can easily read every element on the dial. 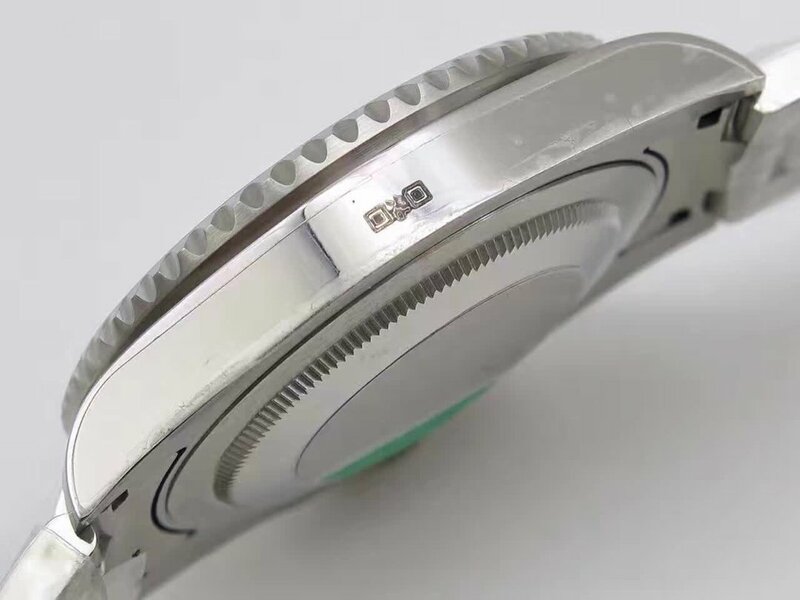 The case is made of 316L stainless steel, which is brushed, the bezel is rotating and has 120 clicks, crown guards fully wrap the crown to prevent it from being damaged by collision. 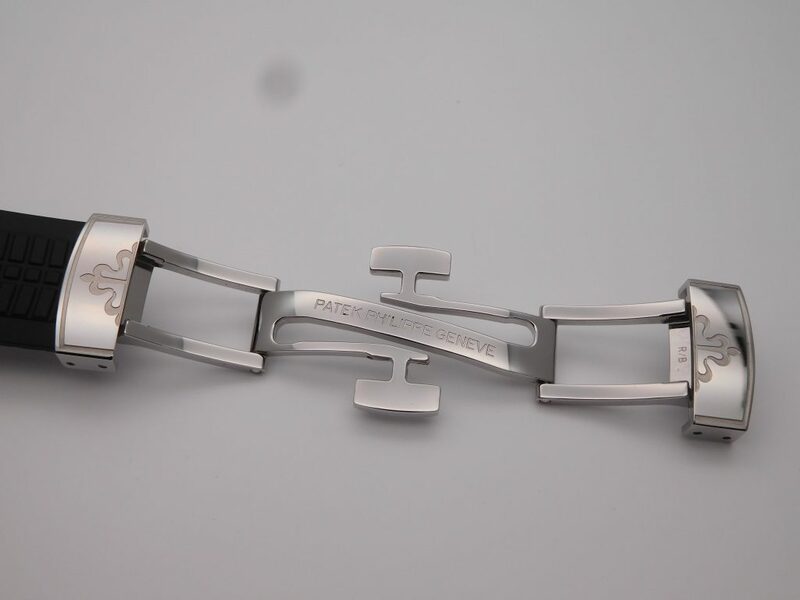 The bracelet is made solid links, not hollow, you can completely feel its weight on hand. 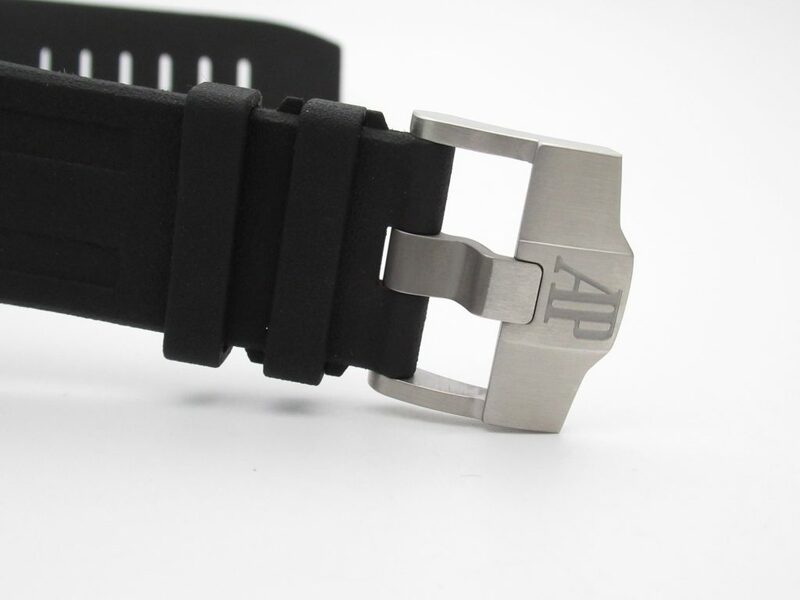 Crown buckle has clear lines and you can see highly-finished engravings on clasp when fully unfolding the buckle. 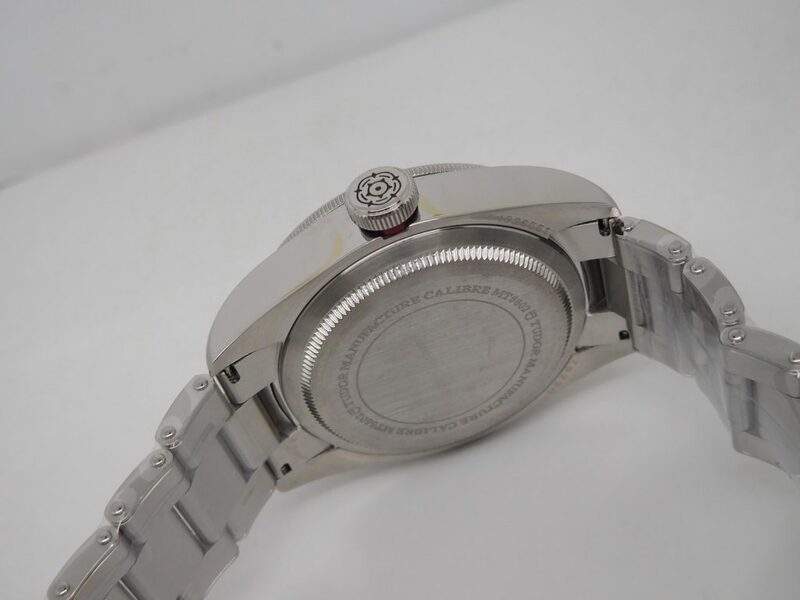 The case back has nothing engravin and it is clean, one thing you may observe is the pins that connect bracelet and case head, they are so strong and will not crack. 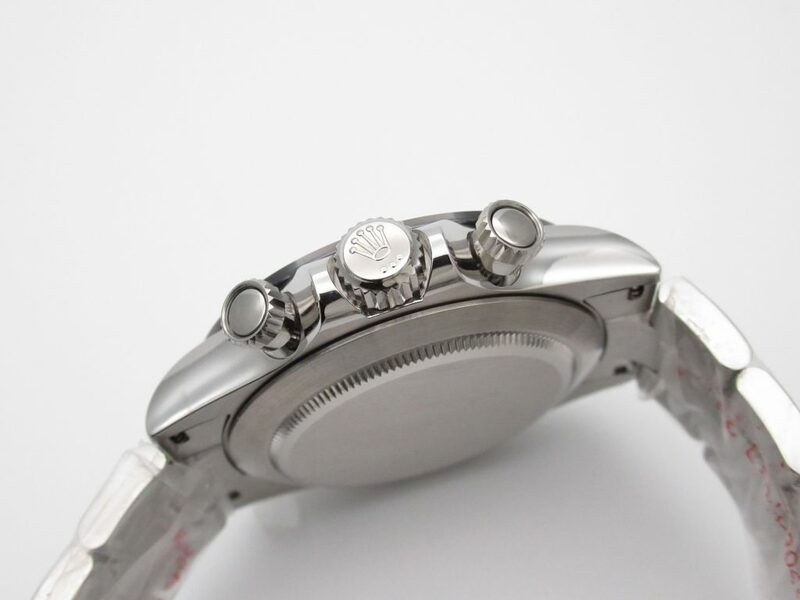 Open the case back, you can find a high quality automatic movement inside, it is an Asian ETA 2836-2, the auto rotor has uniform brushing lines, its plates on the base have beautiful fish scale patterns. 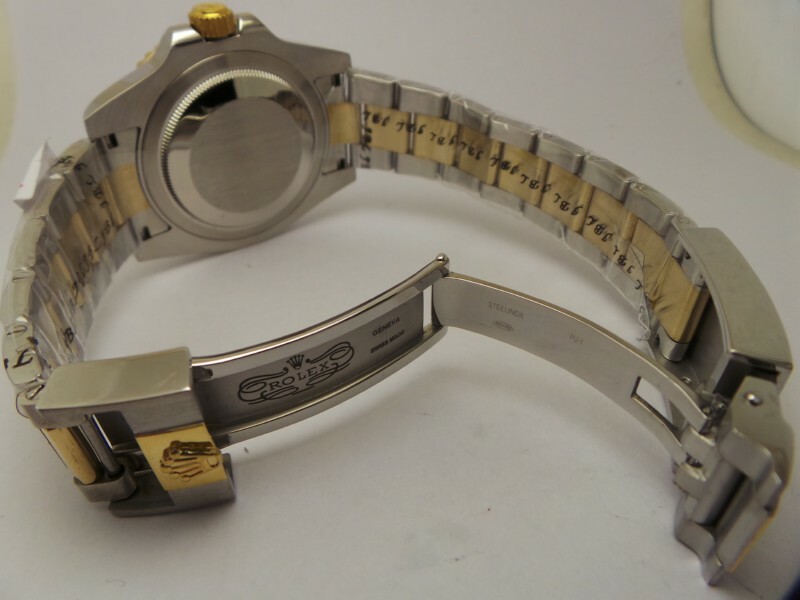 There are 2836-2 numerals engraved on the movement plate. 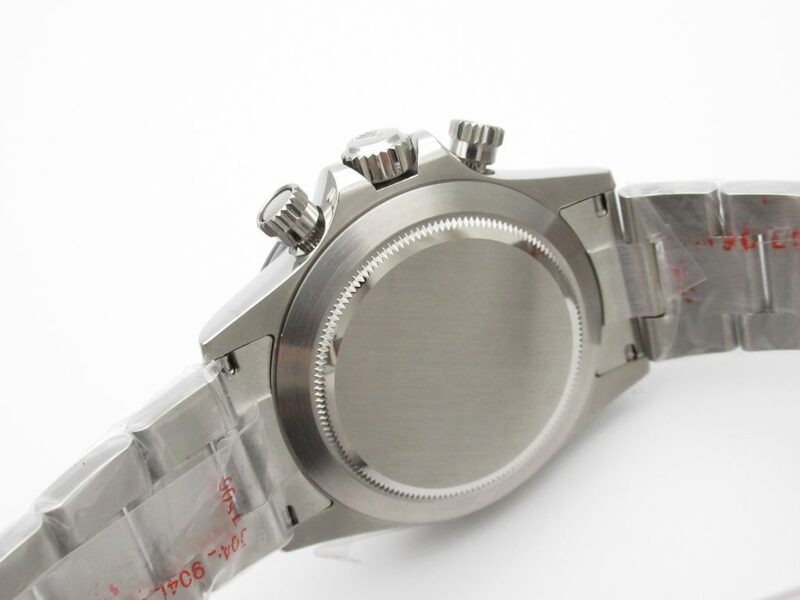 If your watch is slower or faster, adjust the regulator to + or -. 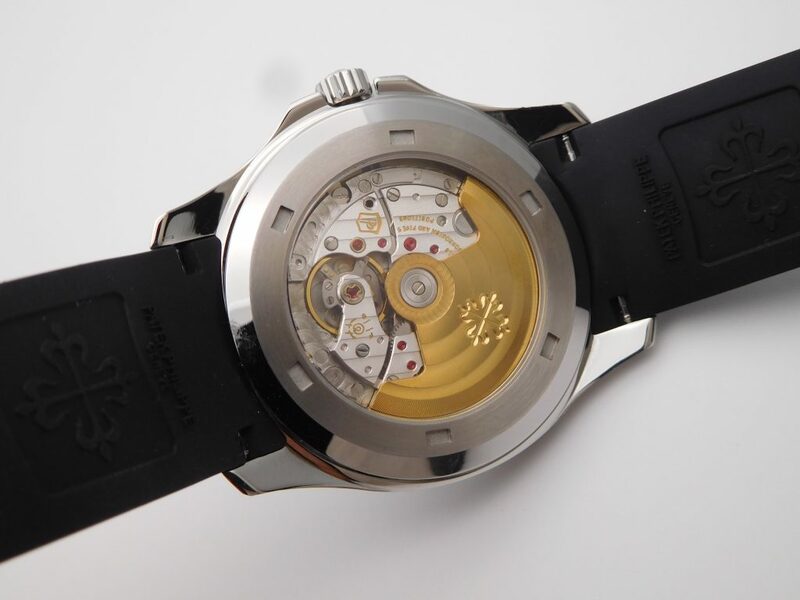 You can also see the balance wheel featuring a rosy shock absorber. 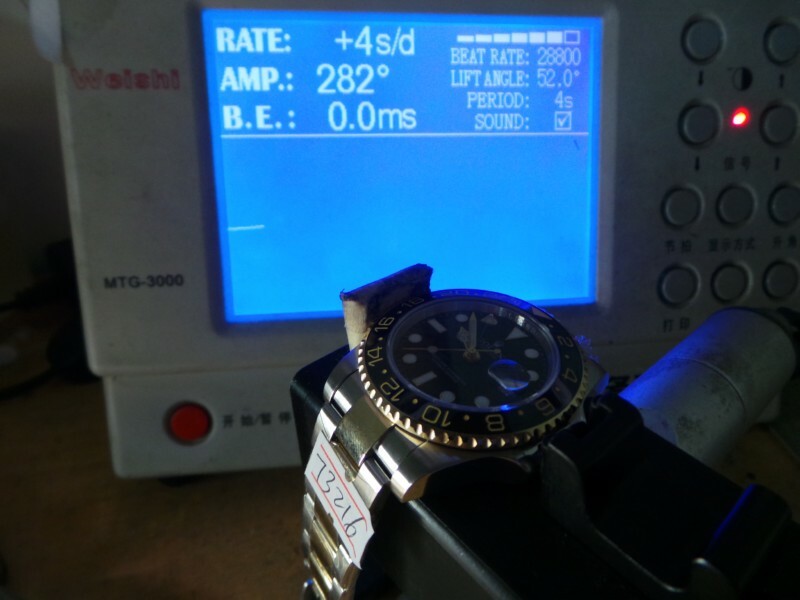 The replica Rolex GMT Master II watch is only 3 seconds slower each day, other specifications like beat rate, lift angle are normal. 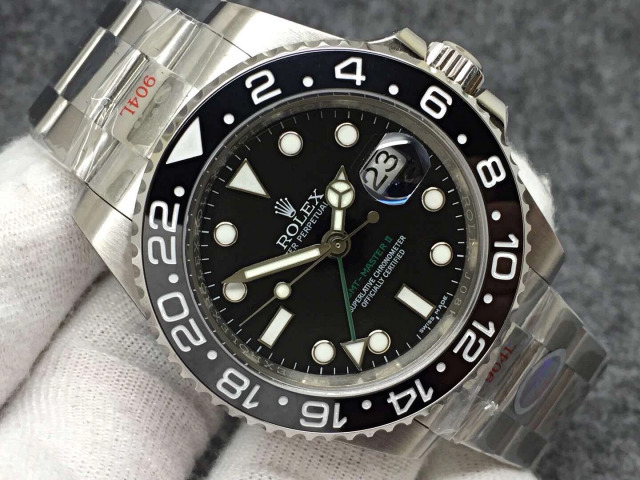 This is the best replica Rolex GMT-Master II I have ever seen. The only difference between it and the genuine lies in the movement. 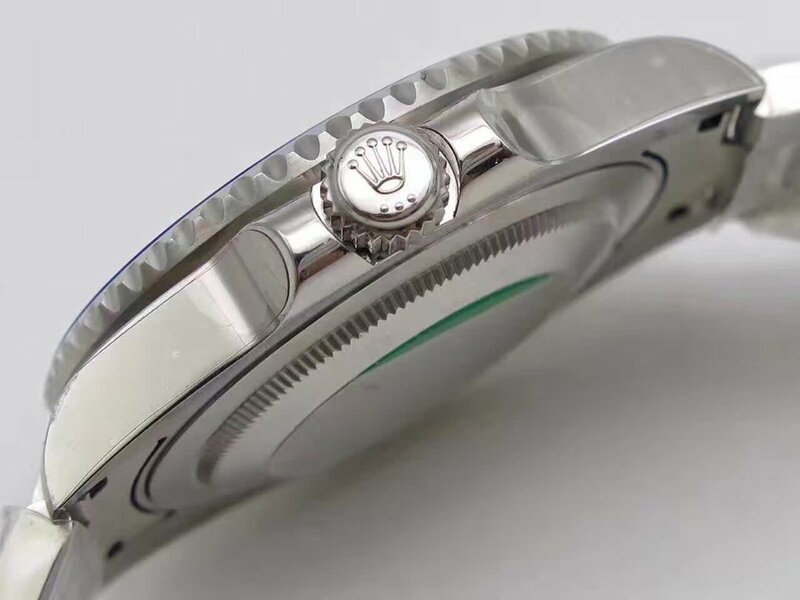 And details and even the watch parts could completely be interchangeable with genuine Rolex. 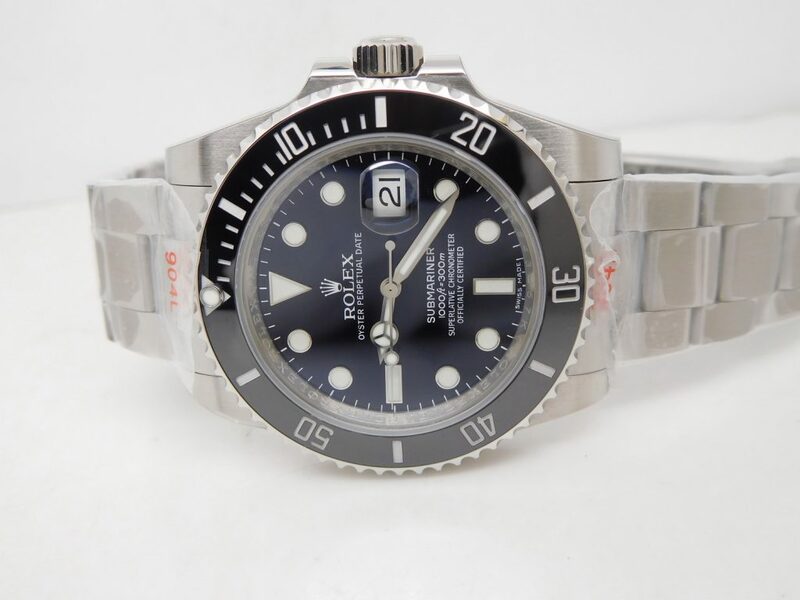 It is another Rolex replica watch that is fitted with rubber strap, the last one I saw using rubber strap is the 2015 Yacht-Master Rolesium watch. 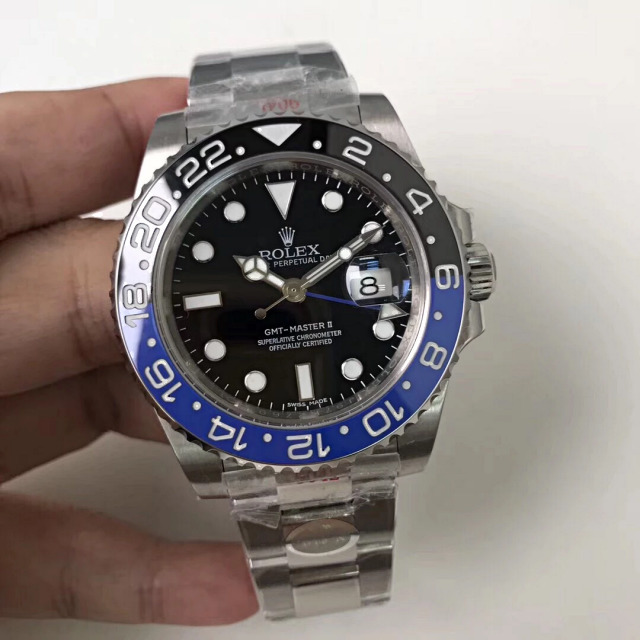 Now this replica looks more sporty than the former because of its unique bezel and blue rubber strap. 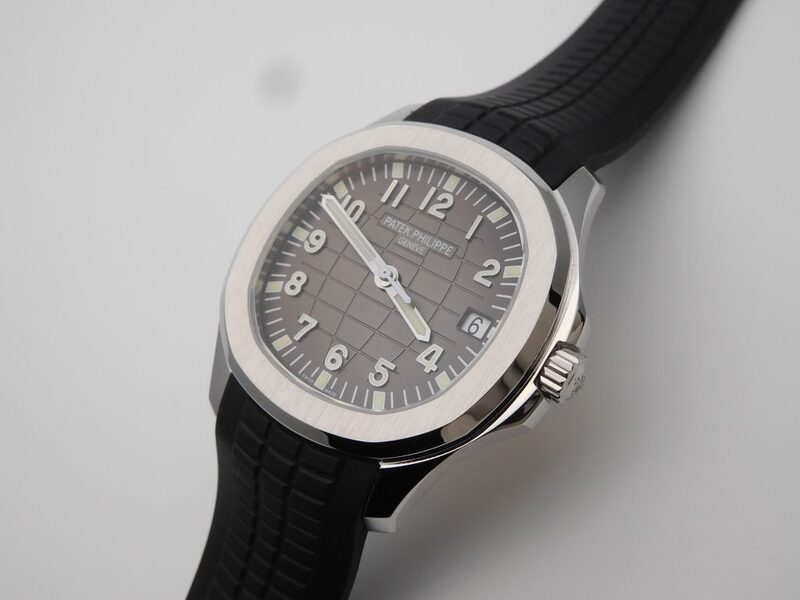 The watch is the replica of 2013 GMT, but it is one of the best versions manufactured in the replica watch market. 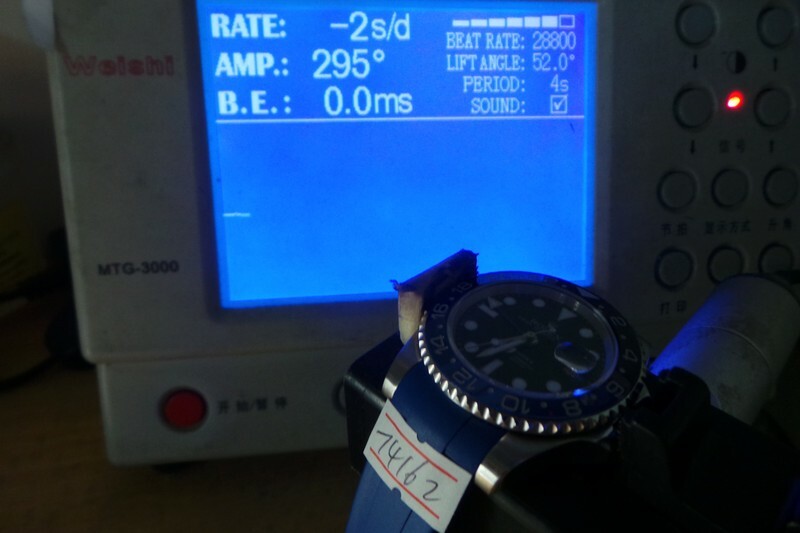 Actually we call such watch 1:1 replica. 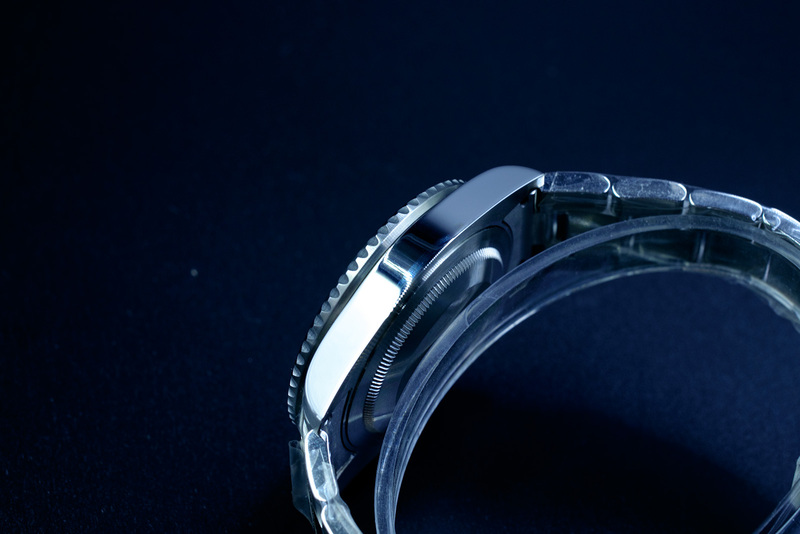 The case is made of brushed stainless steel, black and blue bezel is uni-directional, which is made of genuine ceramic. 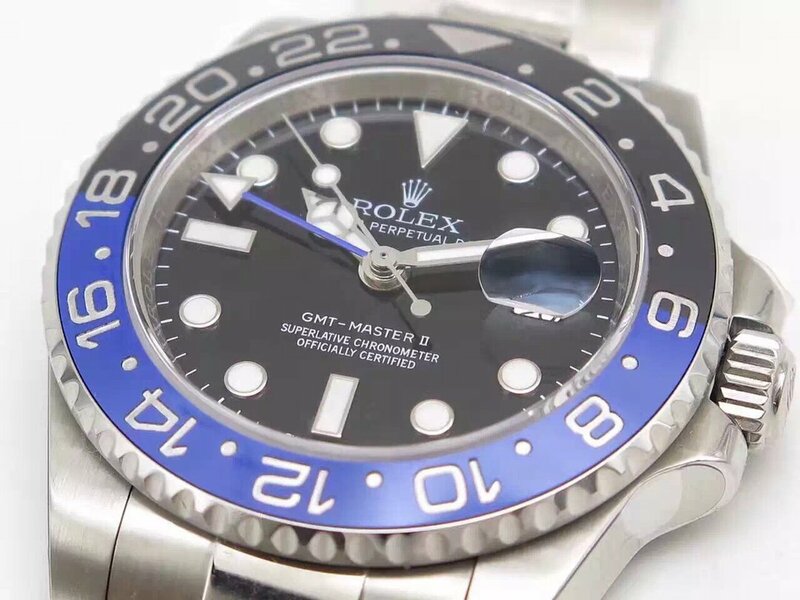 See the black dial, besides its blue superlumed hour markers and hands, the independent GMT hand is also adjustable and works the same as genuine. 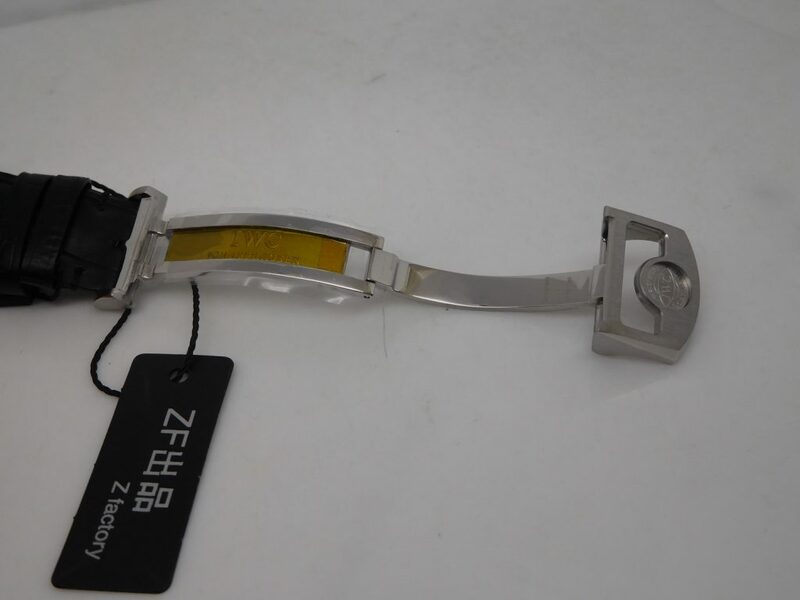 I like its sapphire crystal, it is clear and transparent, with AR coating, the thickness of the sapphire crystal guarantees it have a good water reistance. 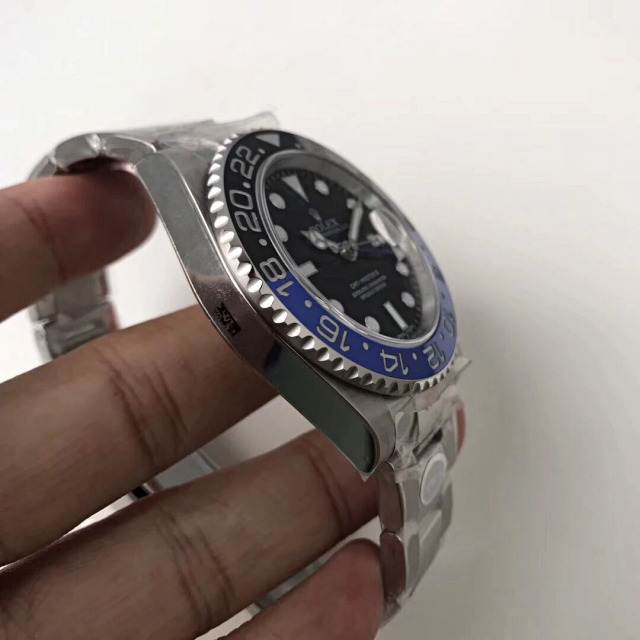 Blue rubber strap echoes with the half blue bezel, the rubber is imported from Thailand and in high quality. It will not broke after a long time wearing. 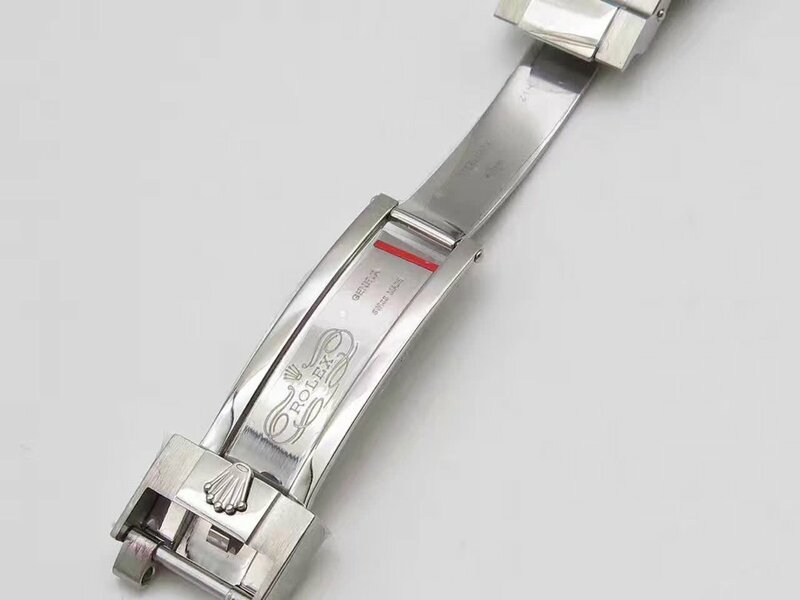 The clasp system is easy to use and has the same construction as genuine, big replica watch factory always focus on these manufacturing details. 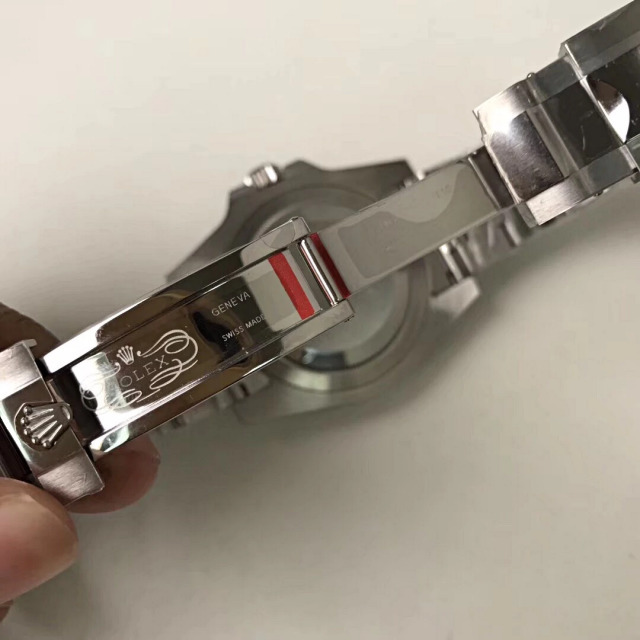 Look at the engravings on clasp, they are very clear, especially the crown logo, in a word, the clasp engraving has correct depth and color. 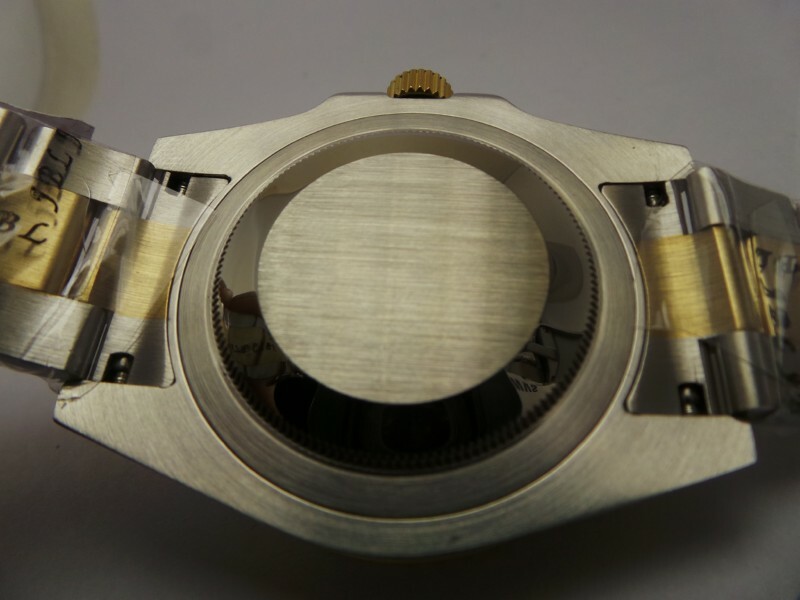 Open the case back, the movement lying inside is an Asian 2813, but its movement rotor and plates are all decorated, so that the whole movement will look like the genuine. Besides, if you have a tool, open it and there is also a waterproofing gasket in the groove. So that the case back could be seaded tightly and water has no chance to enter into.